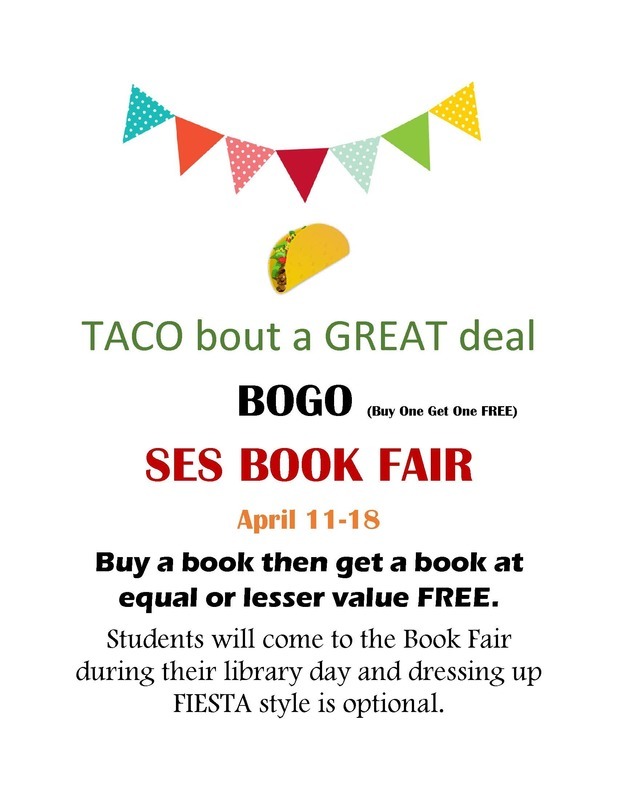 Thank you to all of the parents, faculty, students, and community for making the Smackover Elementary School BOGO "FIESTA" Book Fair a very successful event! 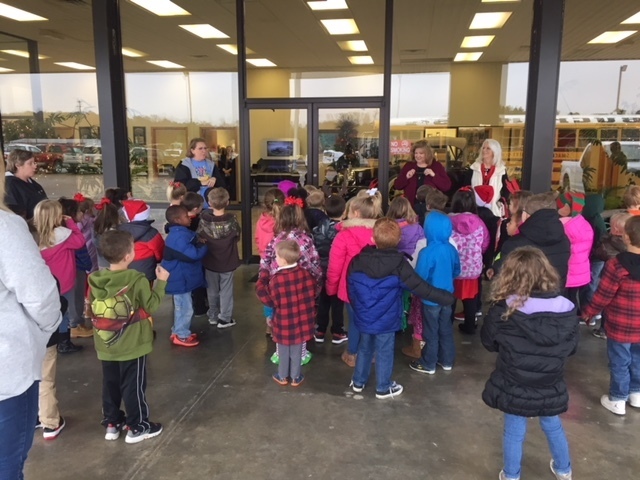 First through third grade students at Smackover Elementary School who met their Accelerated Reader (AR) goal for the third nine weeks got to attend an Easter Egg Hunt last Friday. 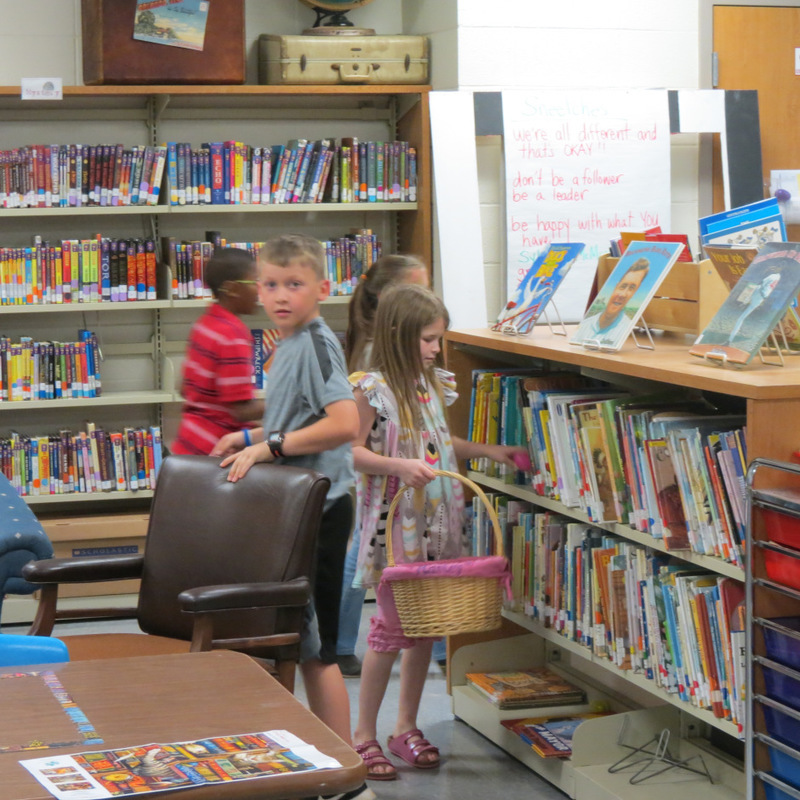 Students who found golden eggs were able to receive a free book from the book fair this week. 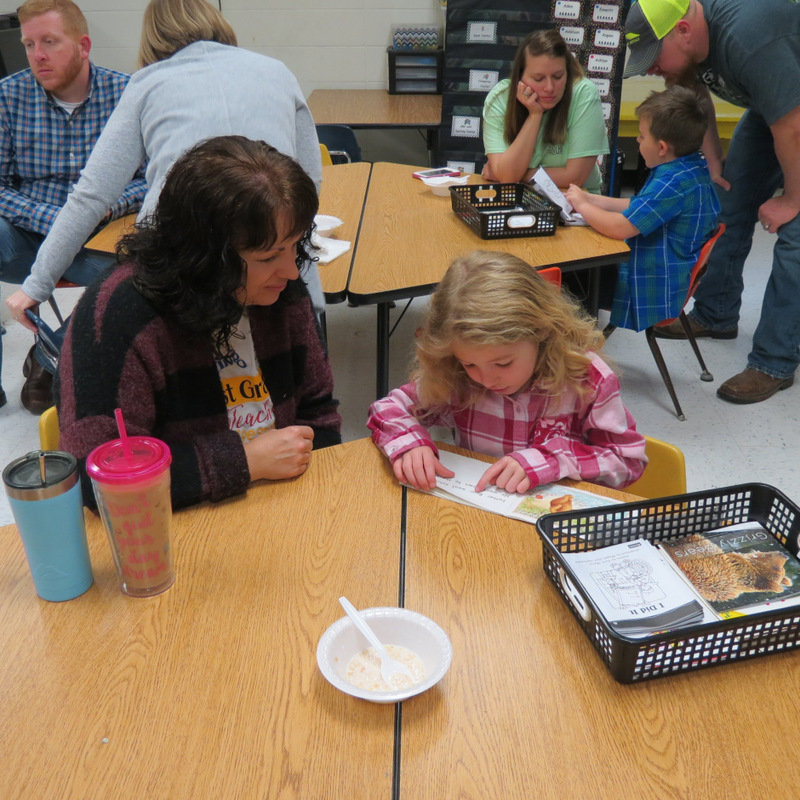 Smackover Elementary School second grade students recently wrote recipes to submit to the El Dorado News Times. 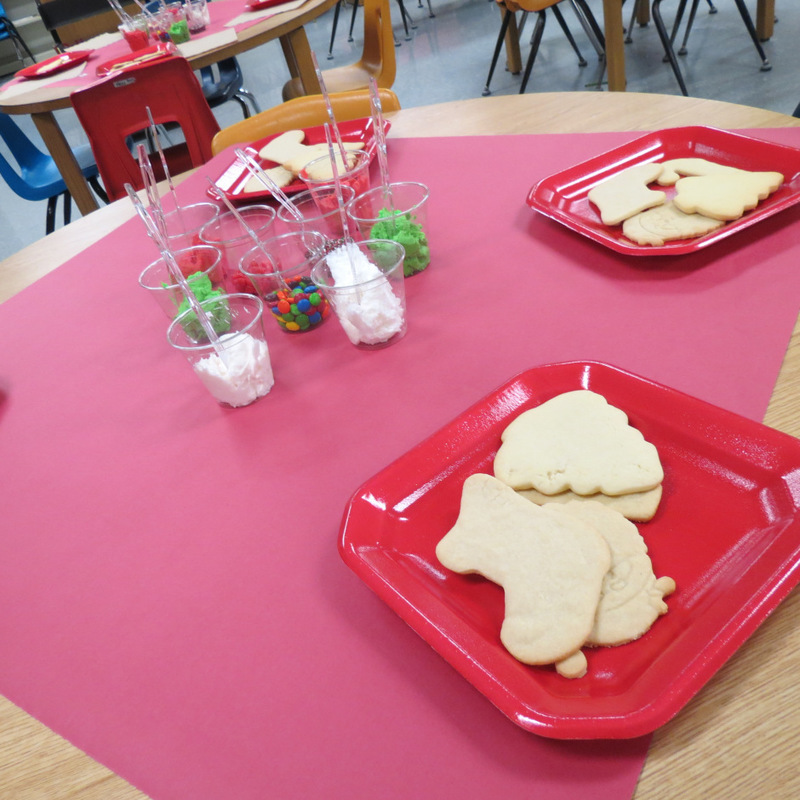 If you are really hungry and craving a delicious bite to eat, then check out these wonderful treats from the second graders! Mrs. Fogle's Recipe BookMrs. 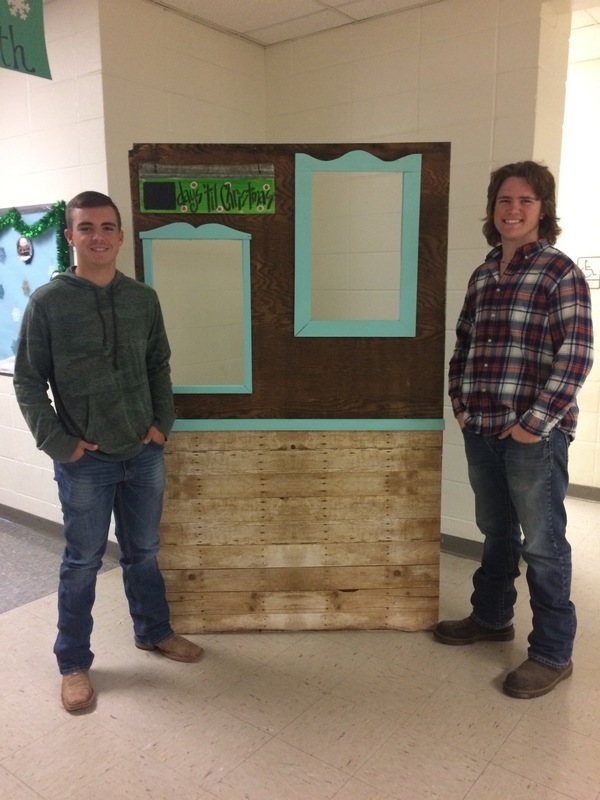 Haltom's Recipe BookMrs. Reed's Recipe BookMrs. Tolin's Recipe Book Bon Apetite! 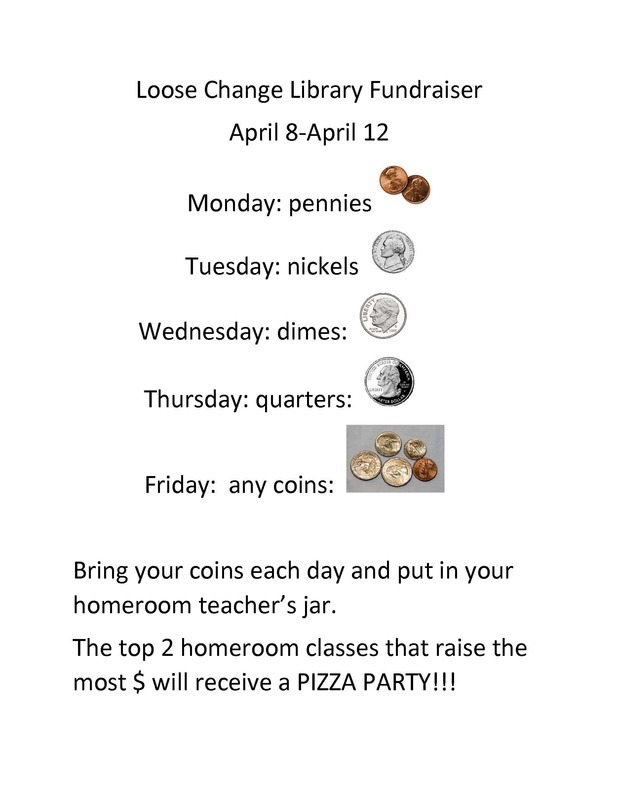 Smackover Elementary School will have a loose change library fundraiser during its book fair next week! 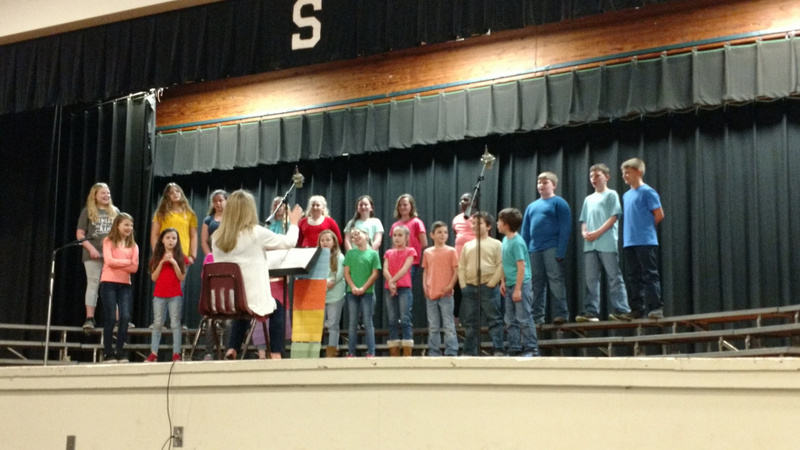 Smackover Elementary School 4th grade students presented the program, "What's On the Menu," at the PTO meeting prior to Spring Break under the direction of music teacher Mrs. Sherri Wood. 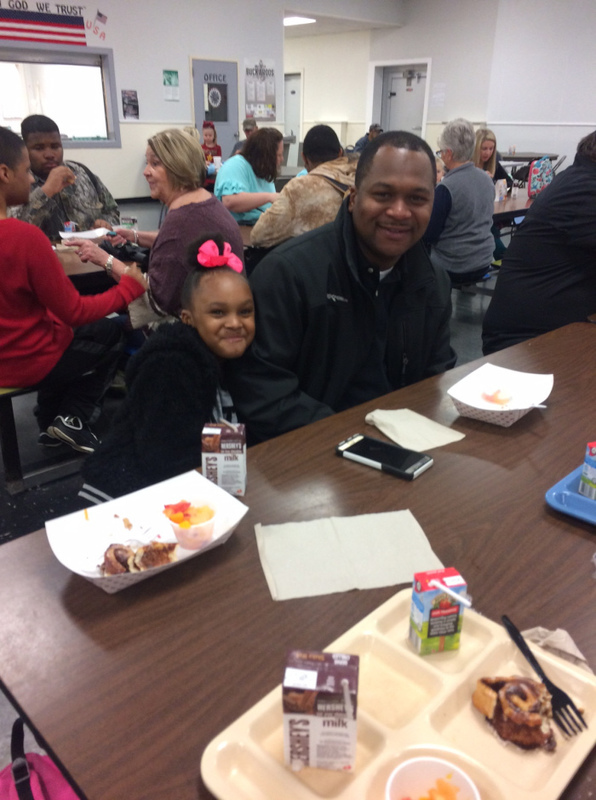 Smackover Elementary School parents were invited to eat breakfast with their children last Friday. On the menu: the world famous cinnamon rolls prepared by the hard working cafeteria staff! 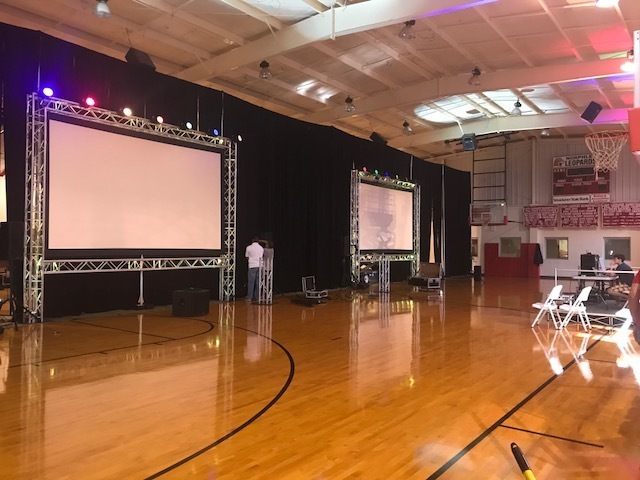 Sixty second through eighth grade boys at Smackover Elementary School, Norphlet Elementary School, and Nophlet Middle School participate in fun and engaging eWeek activities sponsored by Lockheed Martin today. April Dining Menus Now Available! The Little Miss Derrick, Jr. Miss Derrick, and Miss Derrick Pageants will be held Saturday, April 27th at Hobgood Auditorium. 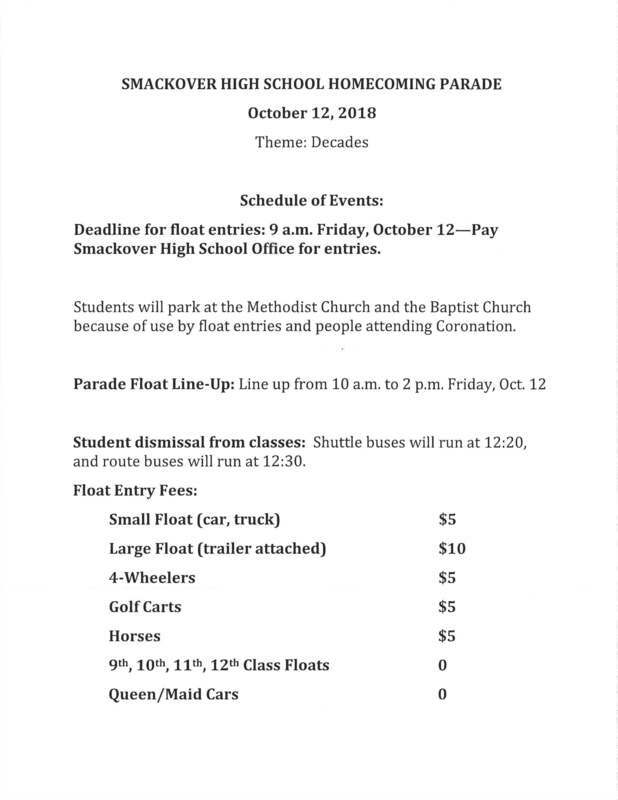 Entry forms may be picked up at Smackover High School. 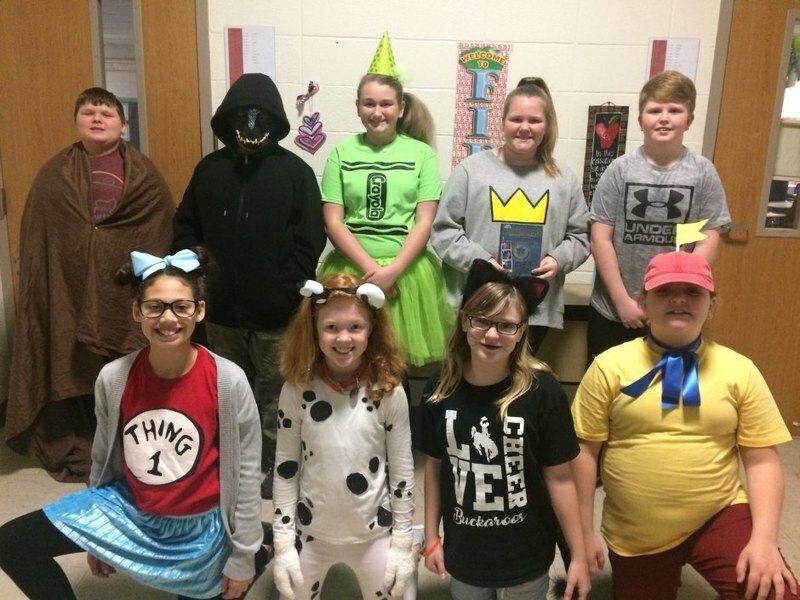 Smackover Elementary School students celebrated Read Across America Week last week with dress up days and lots of fun activities and stories in the library. 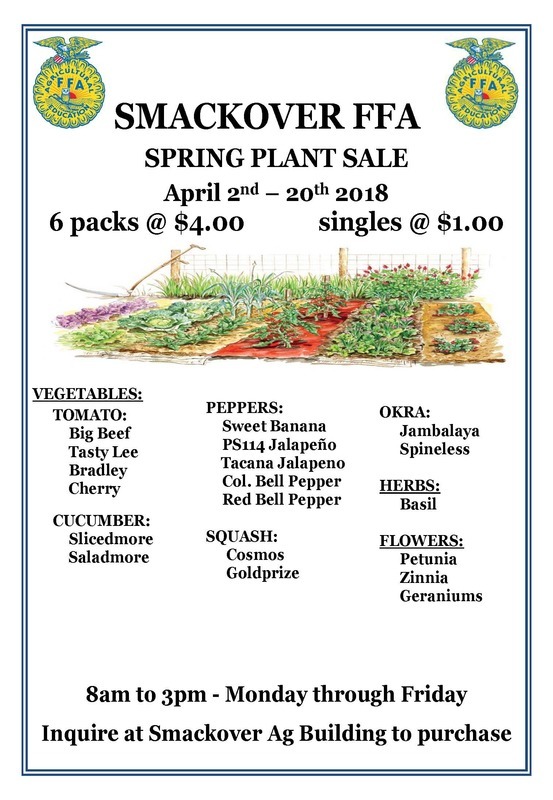 The yearbook sale for Smackover Elementary, Norphlet Elementary and Smackover Preschool will end Friday, March 8th. Yearbooks may also be ordered online at jostens.com. Norphlet Middle School is also taking orders for its yearbook through March 8th. Don't miss the deadline! Order today. 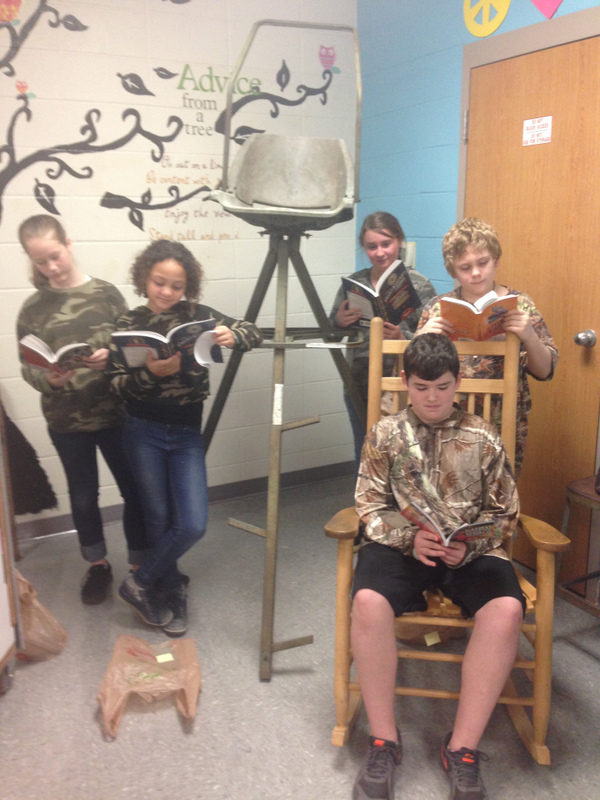 Smackover Elementary School students "HUNTED" for a good book during book fair earlier this month and it was a SUCCESS. Thank you to the staff, parents, grandparents, community, and students. 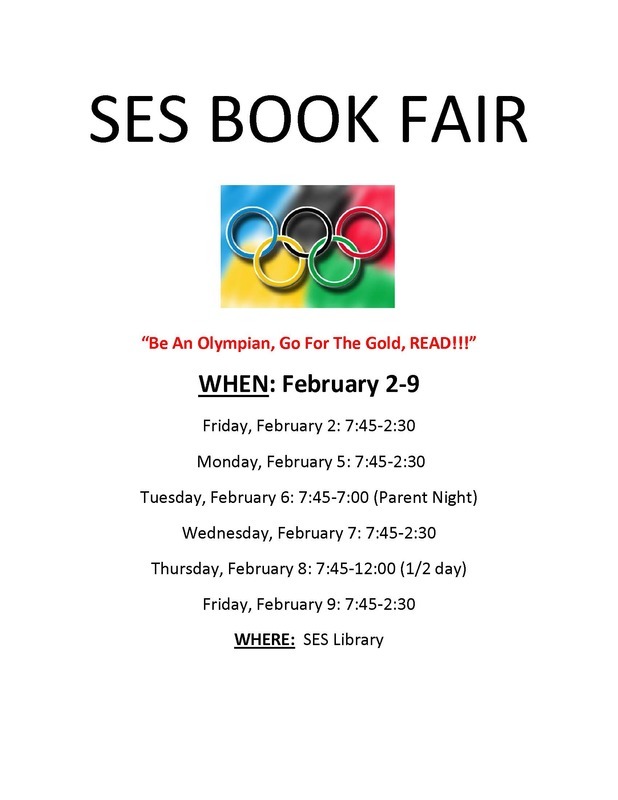 Dr. Seuss Week Is Coming! 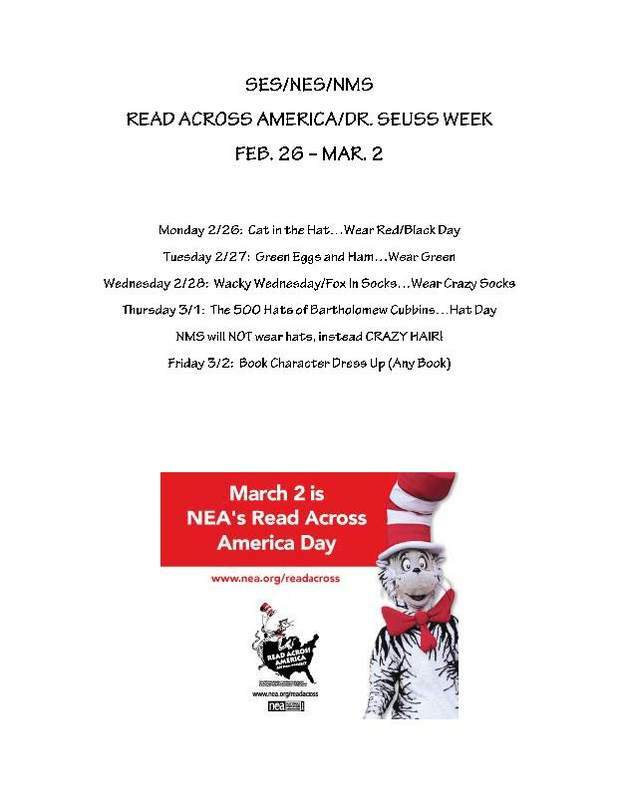 Smackover Elementary School, Norphlet Elementary School, and Norphlet Middle School will all be celebrating Read Across America Week on February 25 - March 1. 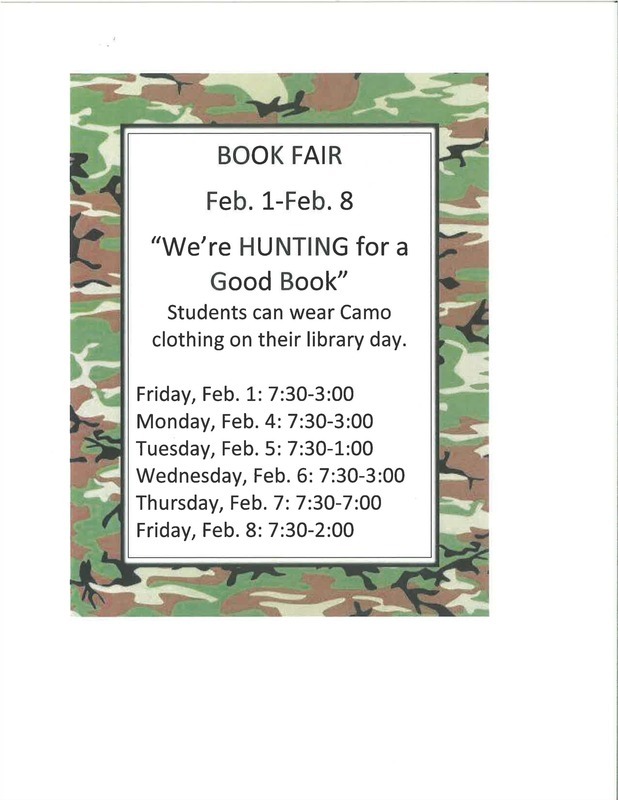 Students on these campuses may celebrate their love of reading by participating in the following dress up days. 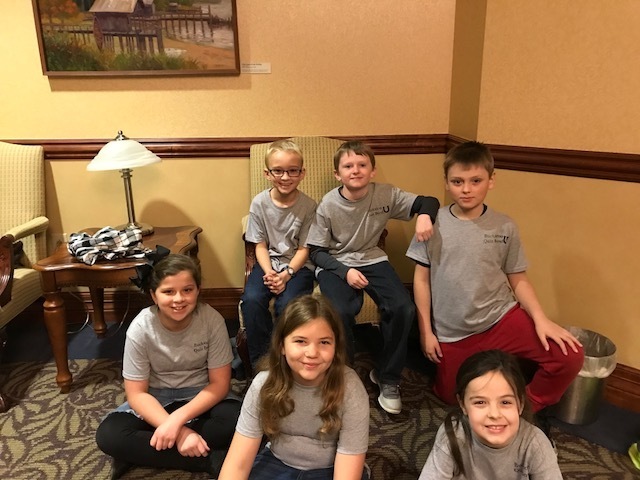 Third through sixth grade GT students recently participated in Quiz Bowl competitions which were held at Southern Arkansas University. 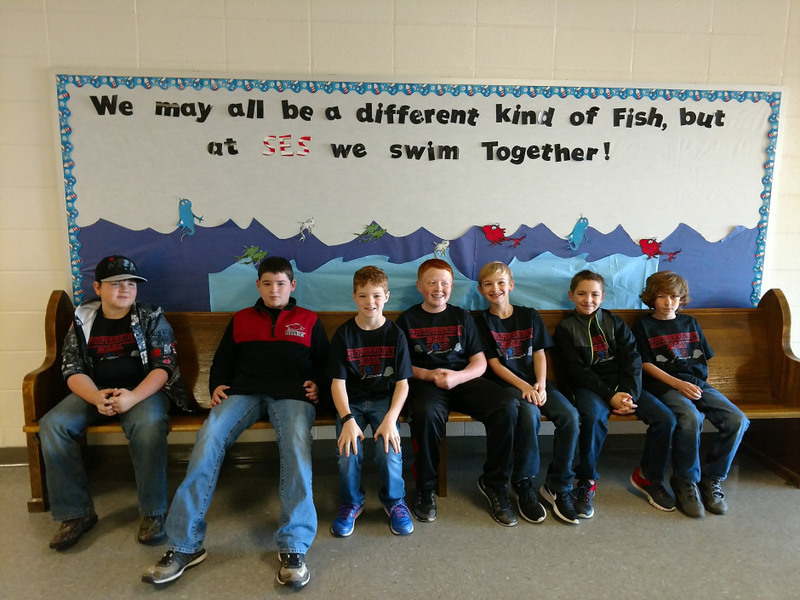 The junior high Quiz Bowl team participated in the AGOBA 3A Regional Quiz Bowl Tournament. 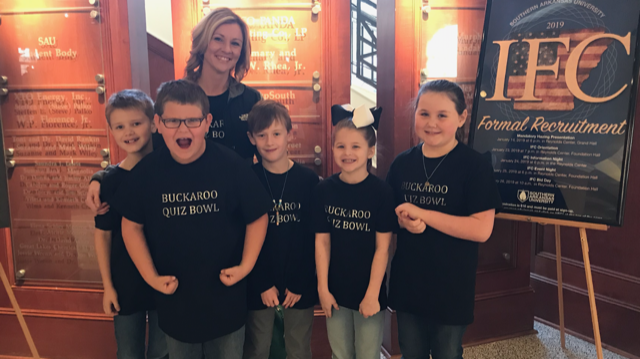 Congratulations to the 5th grade Quiz Bowl team for placing second in their competition! 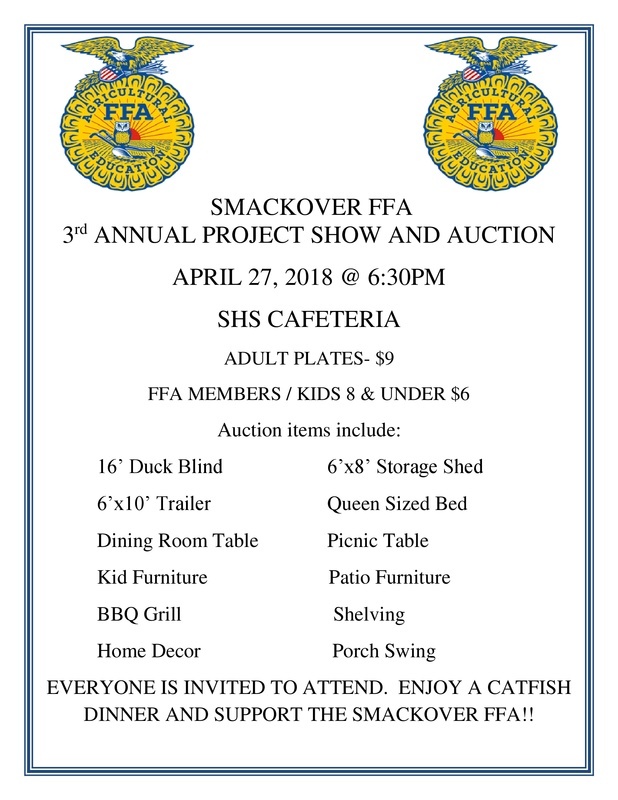 The Smackover Band Program is hosting a fish fry fundraiser on Thursday, February 7th from 4:00-6:00 in the SHS Cafeteria. Plates are $12.00 and include 4 pieces of fish, chicken or a combo of both plus all the fixings, dessert and drink. Tickets will be available at the door for dine in or carry out. Parent-Teacher Conferences Coming Next Week! The Smackover Elementary School student council is sponsoring PJs for Pets this Friday, January 18. For just one dollar ($1), students may wear their pajamas to school. ALL money raised will be donated to UCAPS. 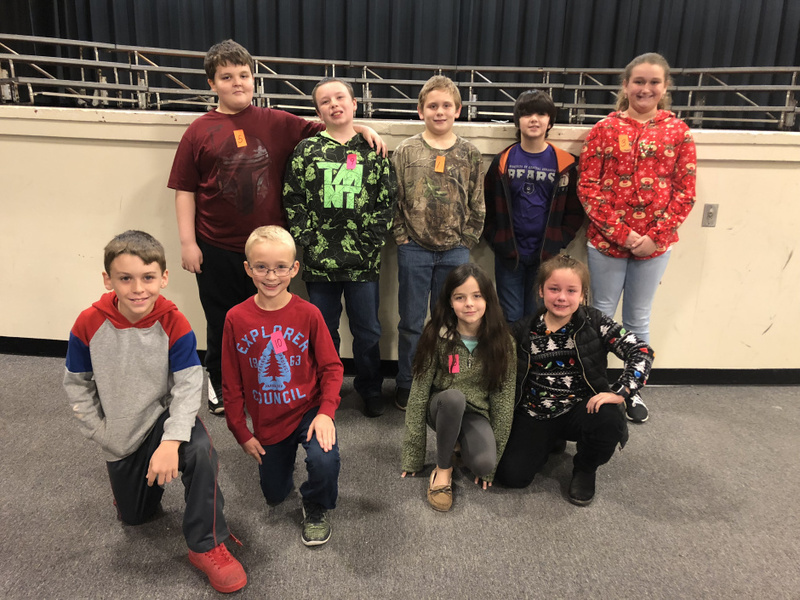 Smackover Elementary School held its annual Spelling Bee on December 17, 2018. Fourth grader Jackson Lee won the Spelling Bee. 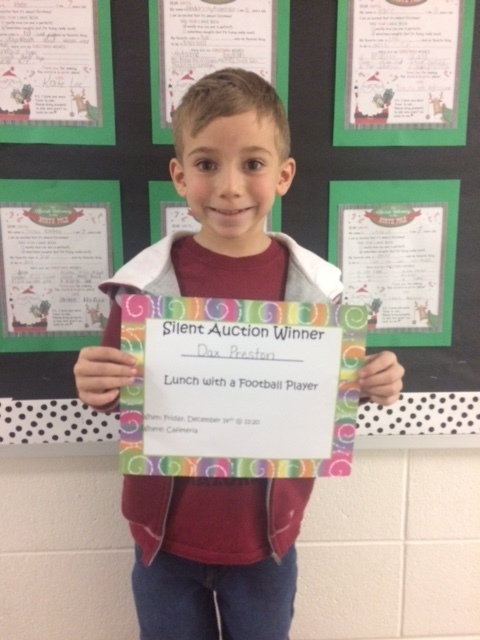 Fifth grader Riley Burch came in second place. 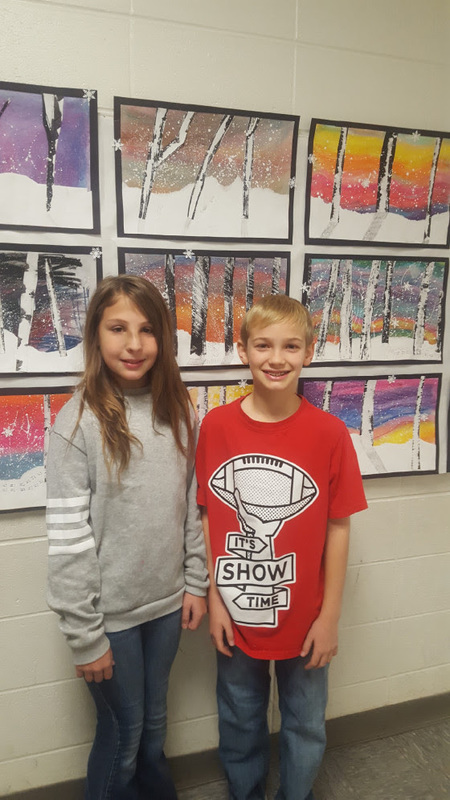 Both students advance to the Union County Spelling Bee which will be held later in January. 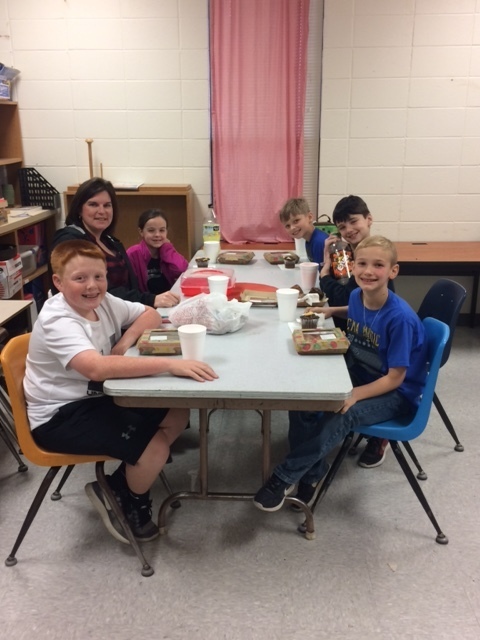 Congratulation to the following Smackover Elementary School students who met their Accelerated Reader (AR) goal for the second nine weeks. 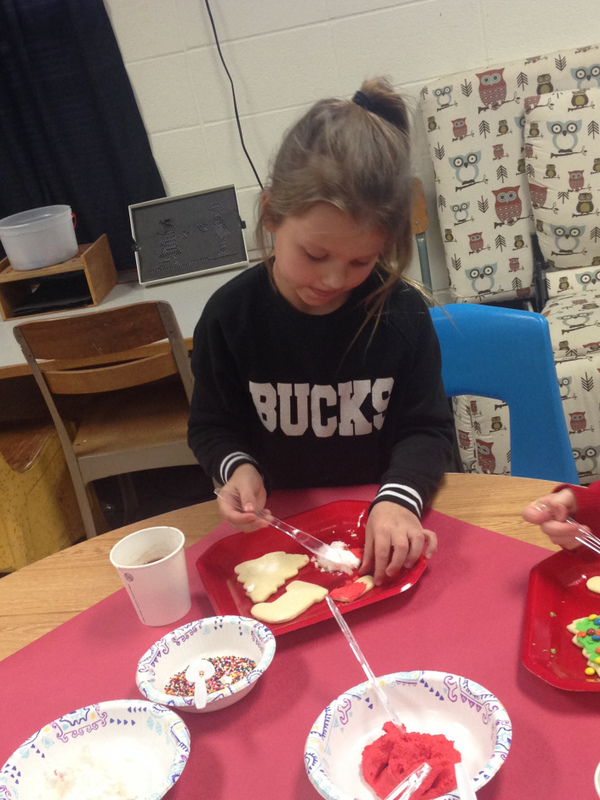 As a reward, these students were able to decorate (and eat!) Christmas cookies! 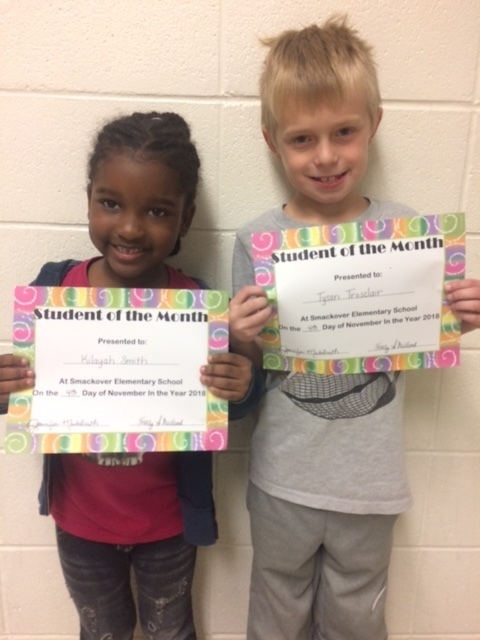 Congratulations to the Smackover Elementary School students and teacher of the month for November! 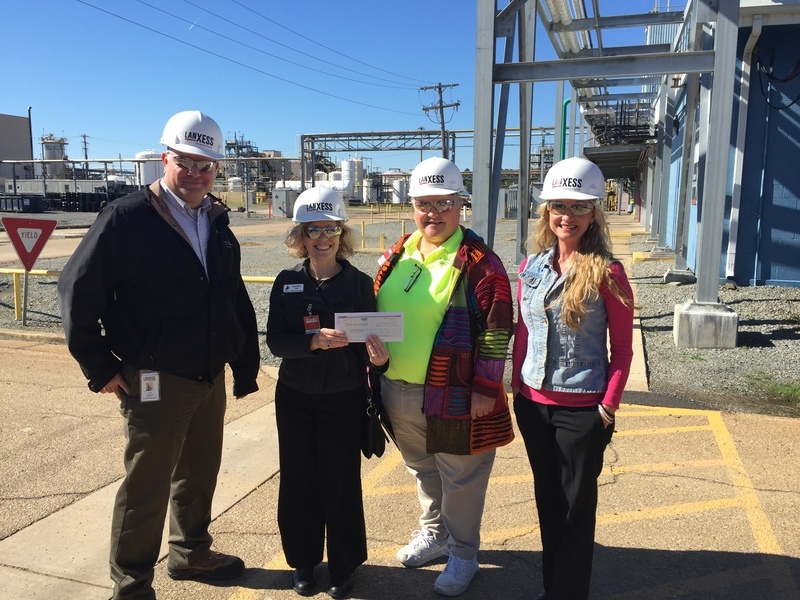 New Mentoring Program to Begin! Don't Forget: Early Dismissal Next Week! 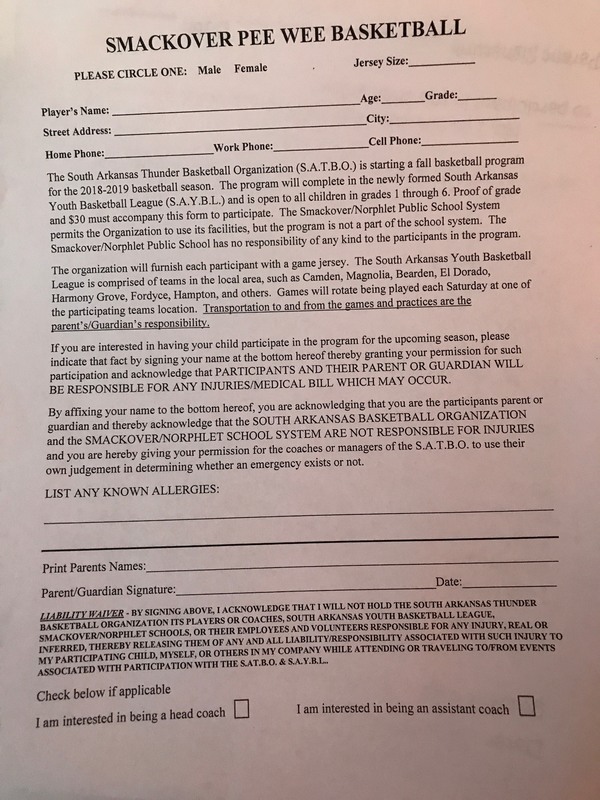 Pee Wee Basketball registration is going on now and we need more players!!! 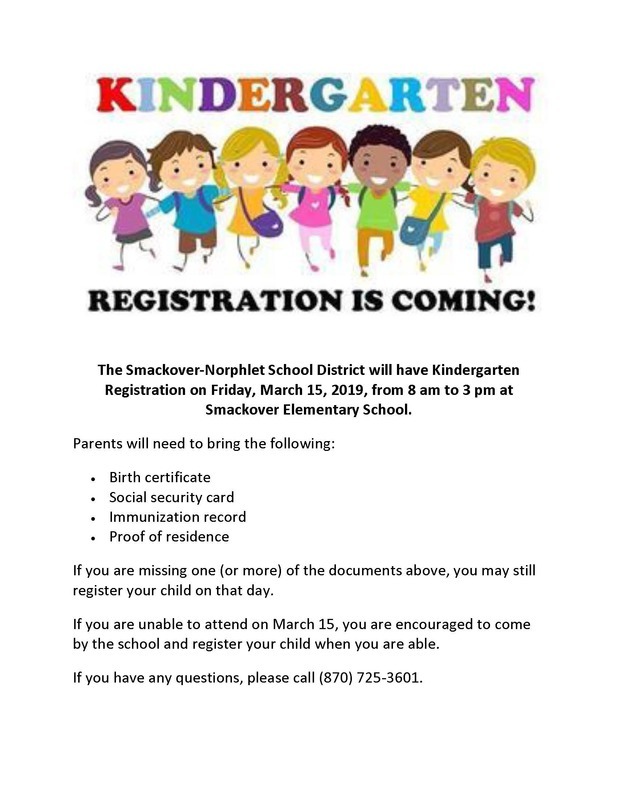 Please register your child as soon as possible if your child would like to play in the upcoming season. 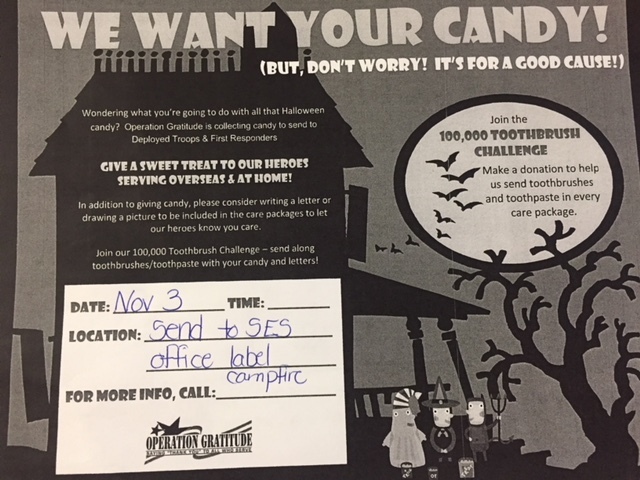 Forms may be submitted to the school offices. 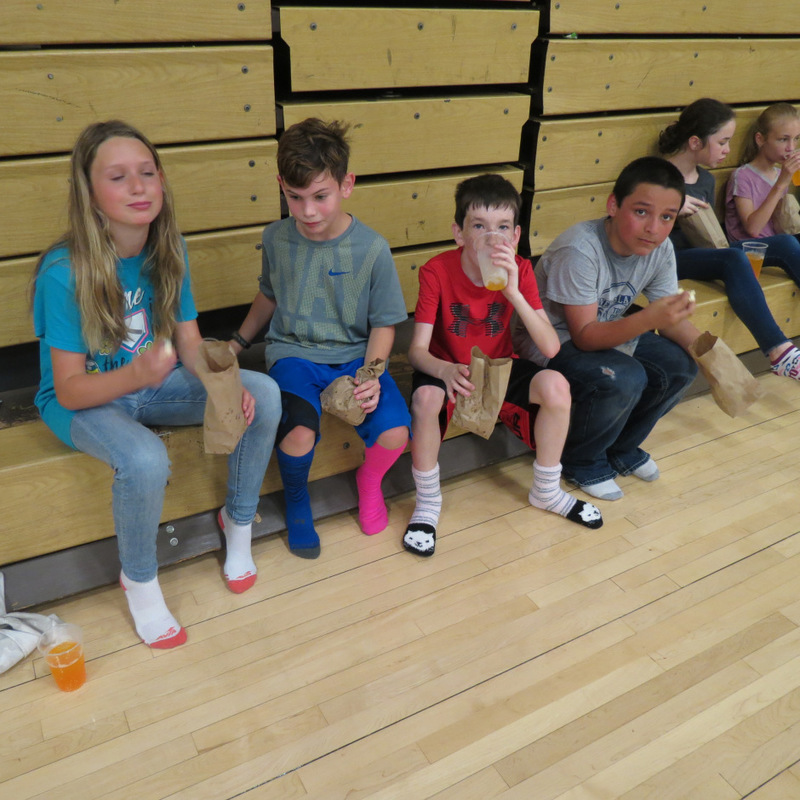 If you need more information about the Pee Wee Basketball League, please contact Ashley Spradley at aed902@msn.com . 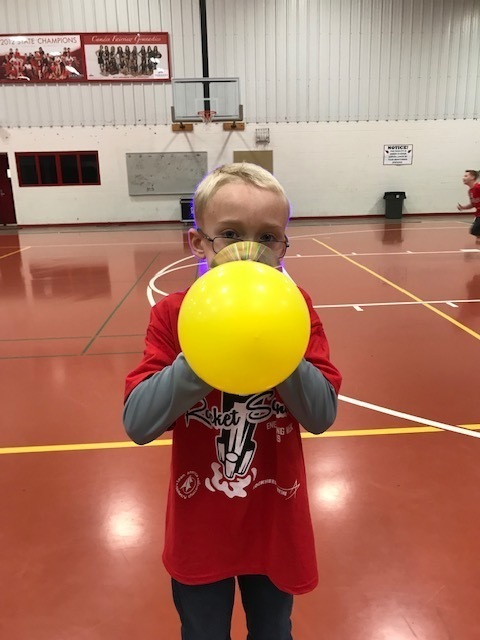 4th Annual Family STEM Night a HUGE Success! There will be a community meeting at the Norphlet Middle School auditorium on Thursday, November 29, at 6:30 pm. 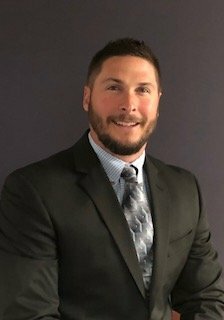 The purpose of the meeting is to discuss potential options for reorganizing the school district for the 2019-2020 school year. 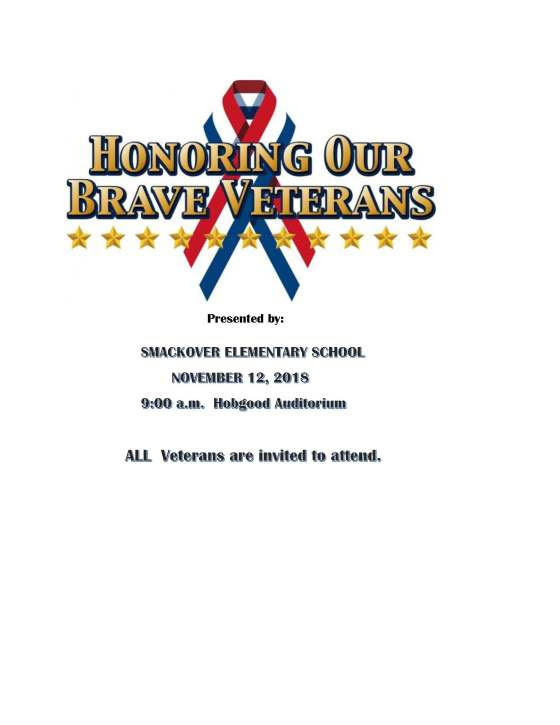 Parents, students, and community members from Smackover and Norphlet are encouraged to attend. 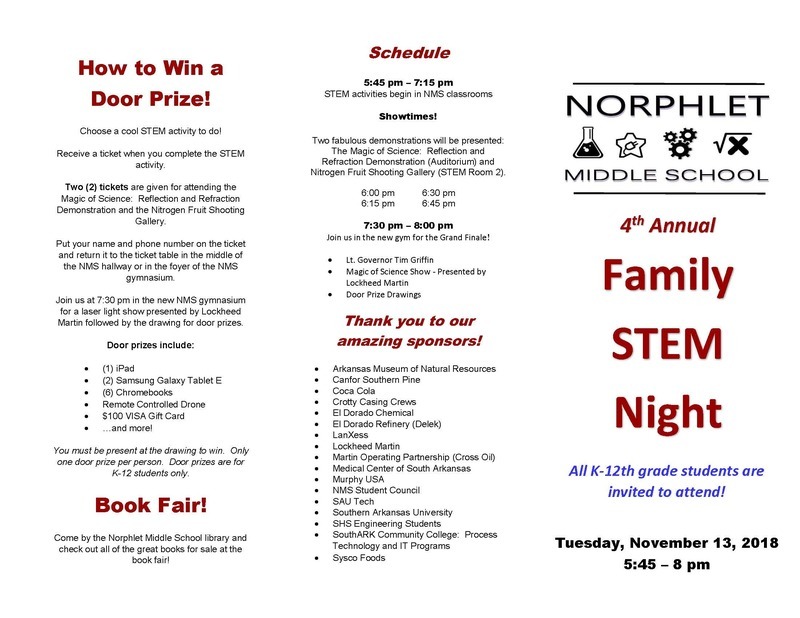 It's Family STEM Night Tonight! 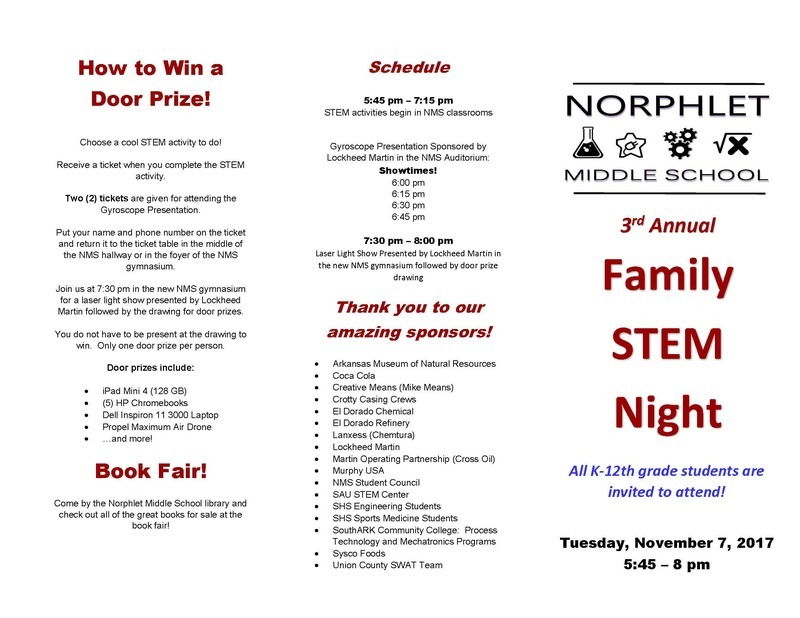 NMS Family STEM Night Sneak Peak #3: Activities! 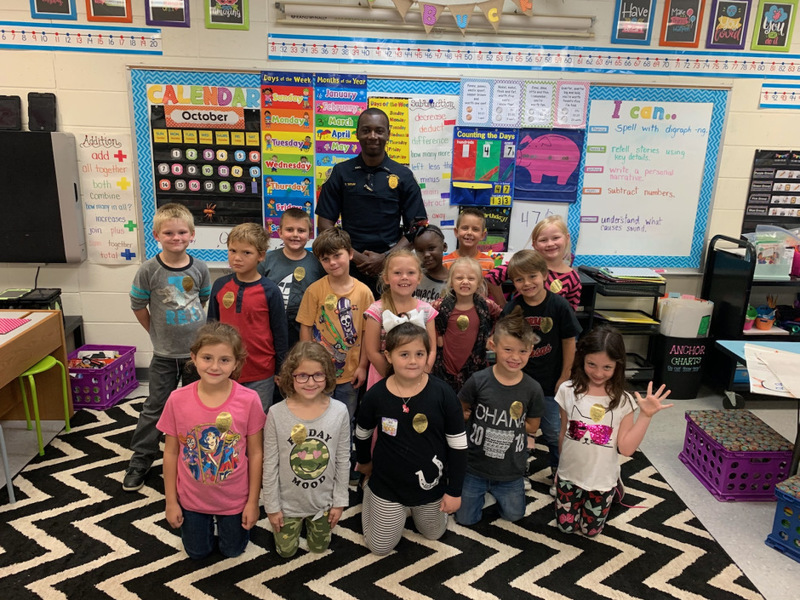 Officer Trey Tatum, of the El Dorado police department, recently spoke to Mrs. Kymberly Hunter's first grade students at Smackover Elementary School about being a police officer as a career. 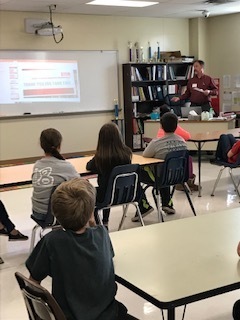 LanXess engineers Jim Parrish and Mark Day visited with Norphlet Elementary School and Smackover Elementary School gifted and talented students about a variety of engineering jobs. Get Your Football Conference Champs T-Shirts Now! 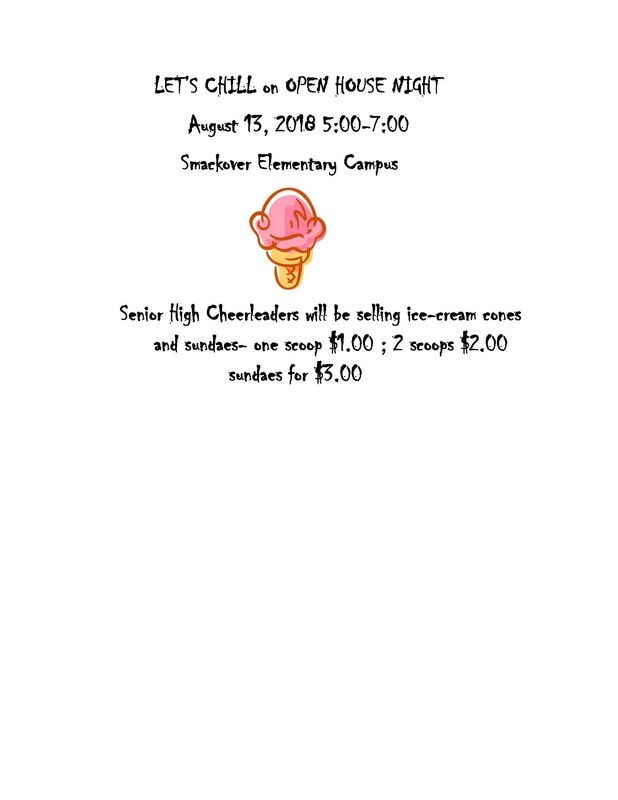 The Smackover High School junior class will be hosting a tailgate this Thursday before the Harmony Grove football game. The tailgate party will be located by the softball field from 5-7. Admission is $10 a person which includes your ticket into the game, a hotdog, bag of chips, and a drink. 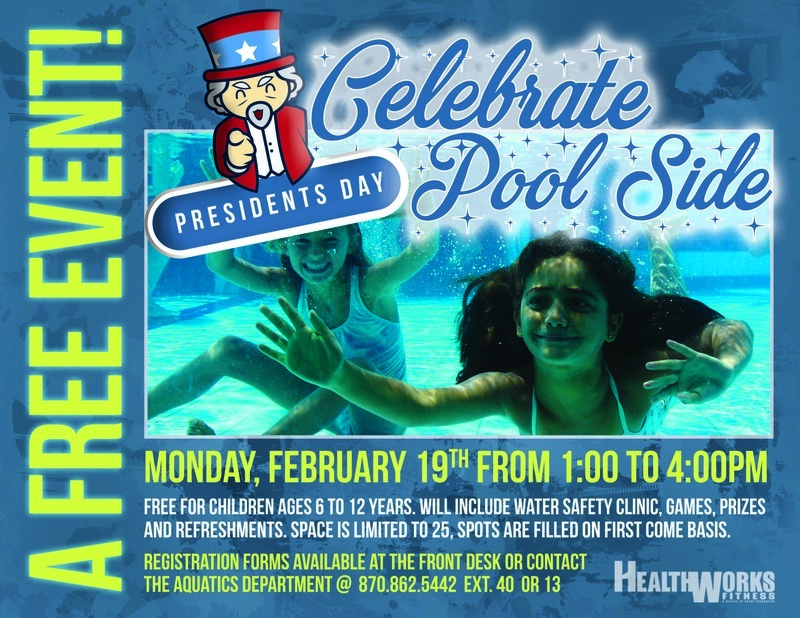 Come join the fun, games, music, and mingling! 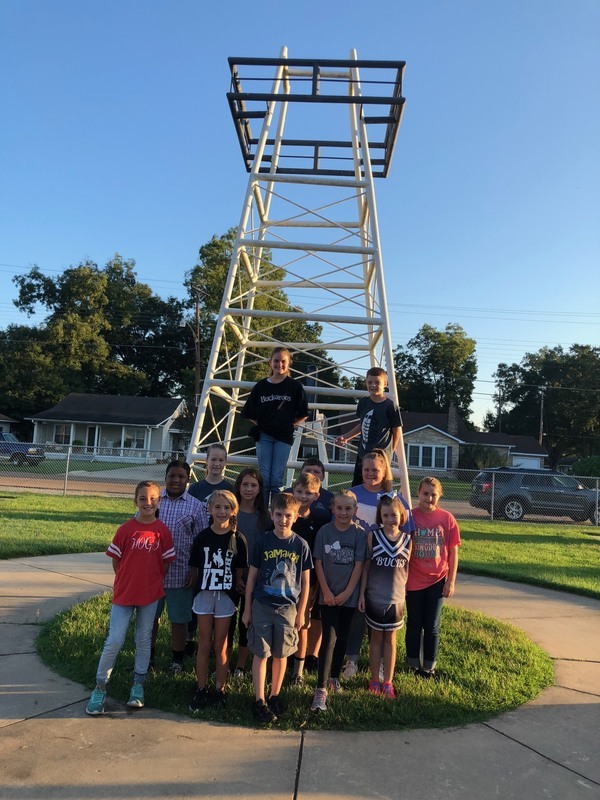 The Smackover Elementary School student council was recently selected. 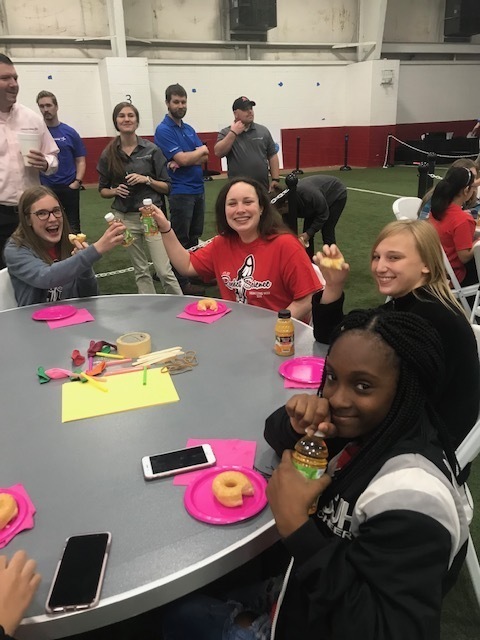 Congratulations to these students! 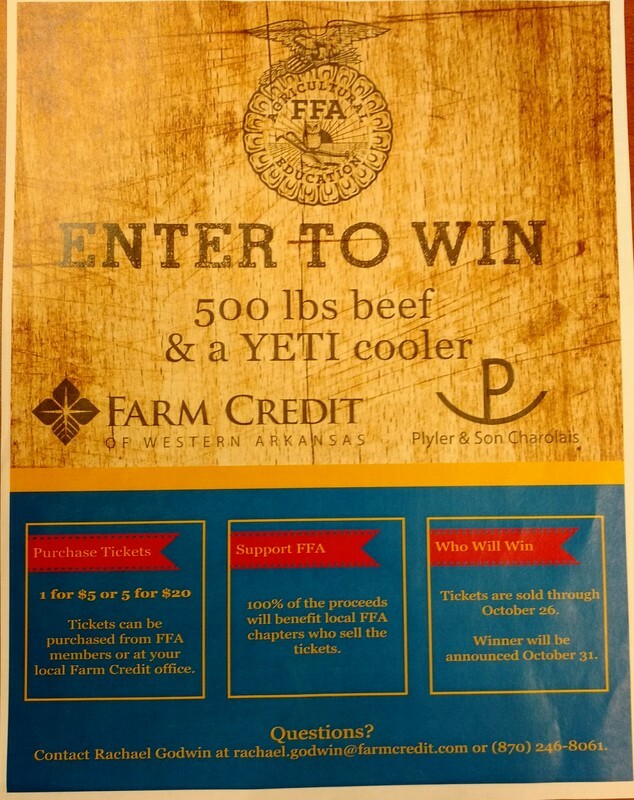 Support the Smackover FFA by purchasing raffle tickets that all FFA members are selling for a chance to win 500 lbs of local farm raised beef and a Yeti cooler. Tickets will be sold through October 26. 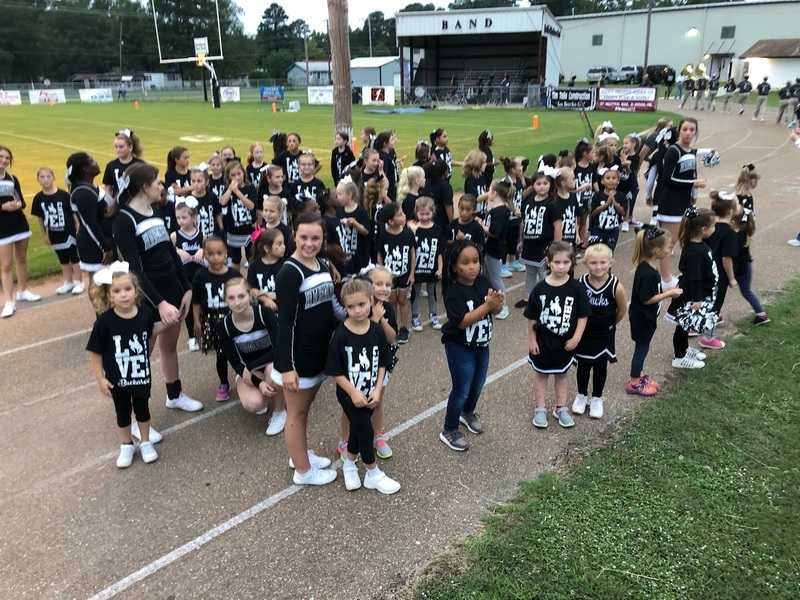 Girls from Smackover and Norphlet Elementary Schools performed their future Buckaroo Cheerleader cheers before a recent Buckaroo football game. A huge thank you to all the girls who participated and their parents! 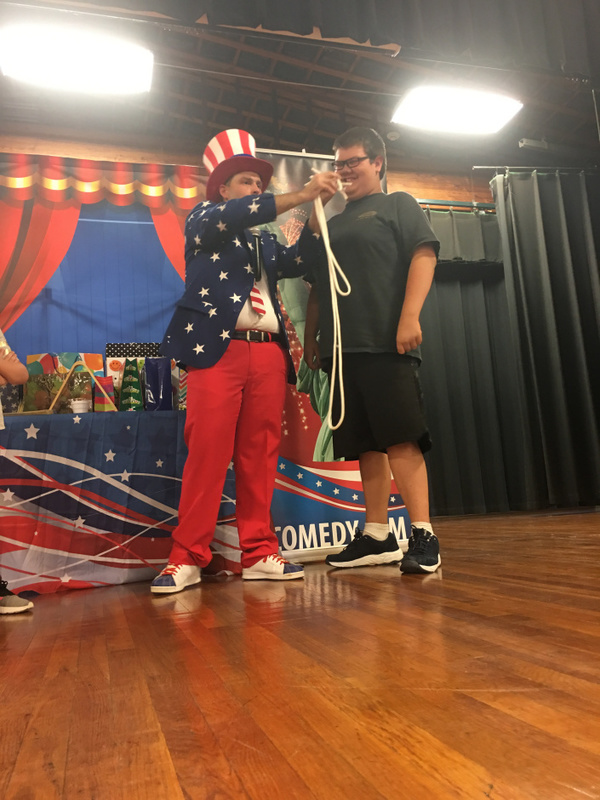 Smackover Elementary School and Norphlet Elementary School third through fifth graders attended the Uncle Sam's Comedy Show. Through comedy and magic, he taught the Bill of Rights, The Constitution, The Declaration of Independence, the 3 Branches of Government, and much more. In celebration of Homecoming 2018, First Financial Bank will be hosting its annual Homecoming Tailgate Party on October 8th at the baseball field. The food should be ready by 7 pm in time for the Snake Dance. The bank will be serving free hot dogs, chips, and water. 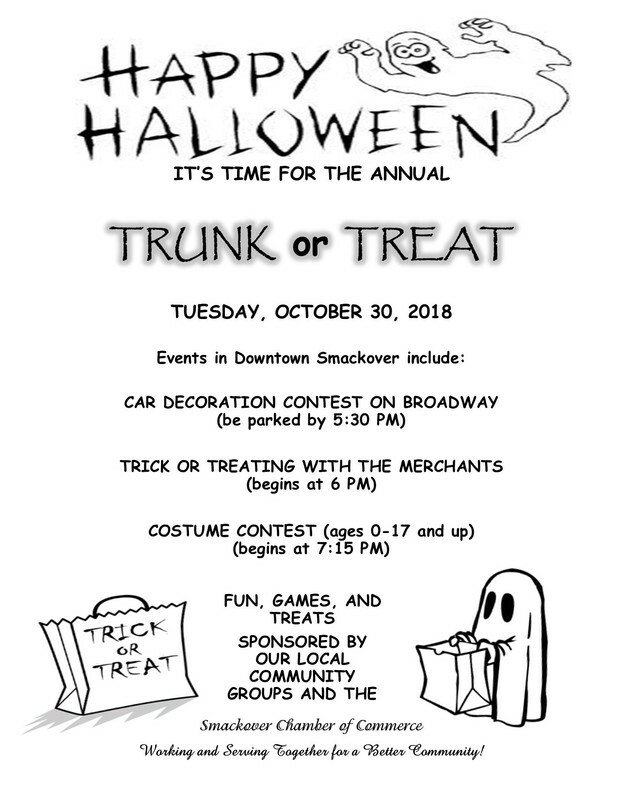 Everyone is invited to come out and enjoy the fun! 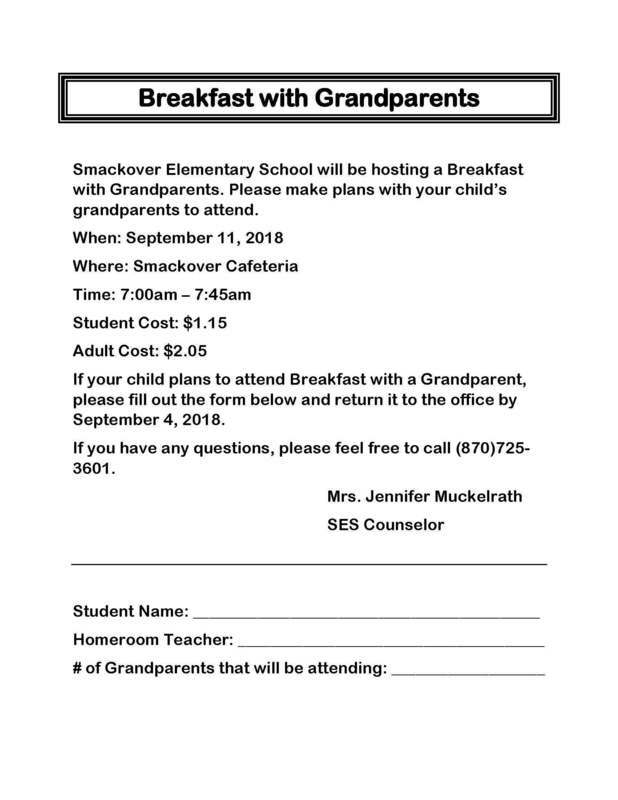 There will be a Smackover Elementary School PTO/Family Involvement Meeting on Thursday, October 4, 2018.The meeting will be at 6 pm in the SES library. 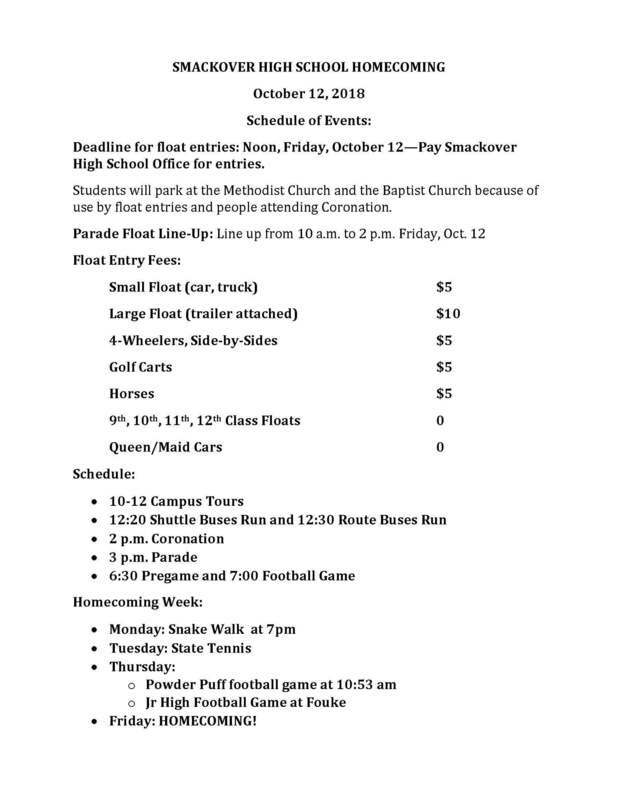 The meeting will be a discussion of the SES Float for the Homecoming Parade. 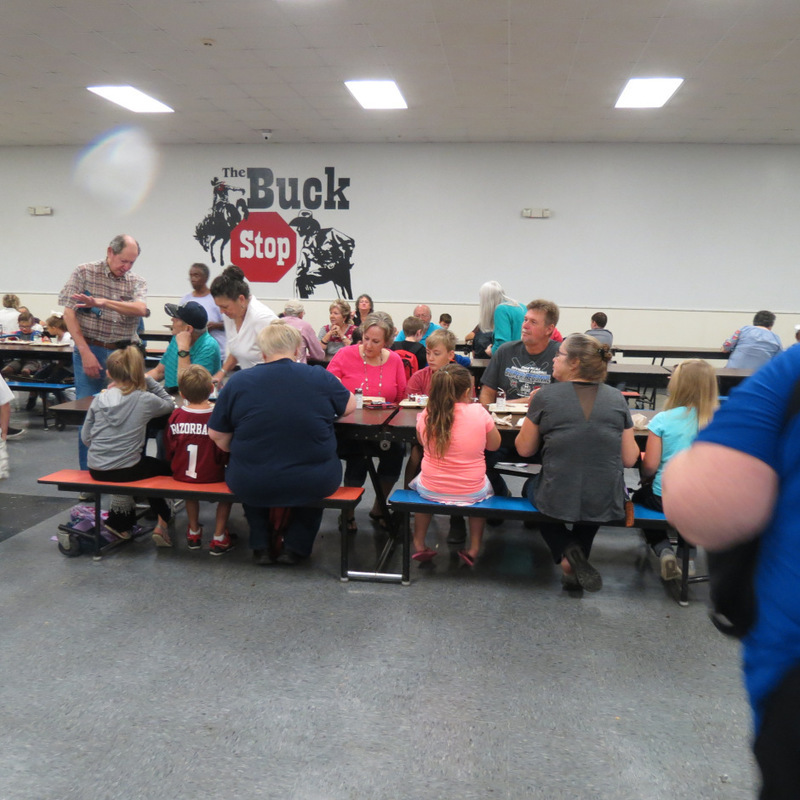 Smackover Elementary School invited grandparents to eat breakfast with their grandchildren on Grandparent's Day. 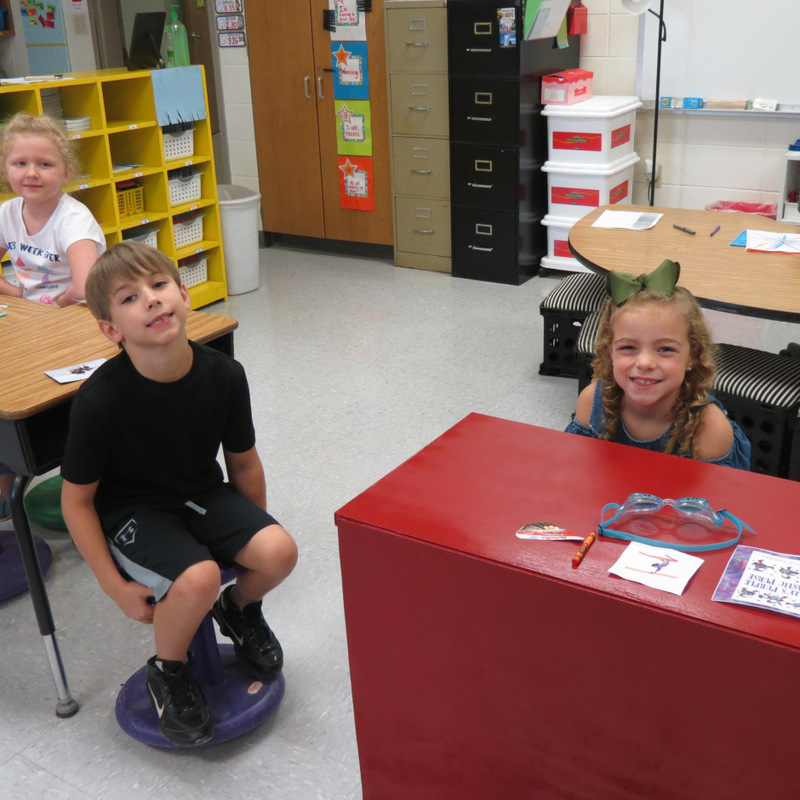 Smackover Elementary School's second grade hosted a Me Museum during the first week of school. Students introduced themselves to parents and shared three things about themselves. Thank you to all of the parents who came to visit the Me Museum! Our schools are always better when parents are partners! 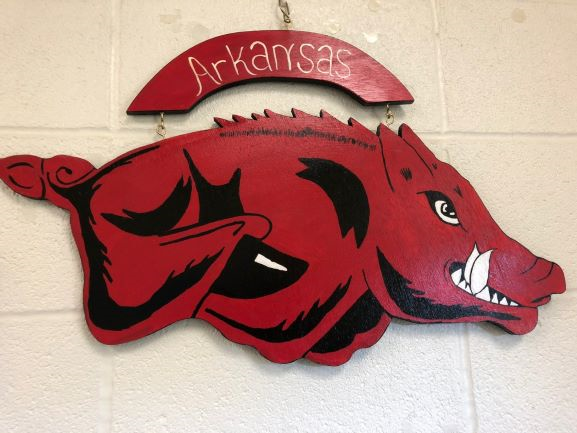 The Senior High Cheerleaders are raffling of this awesome Razorback which is over two feet long to help fund their trip to the cheer nationals this winter. 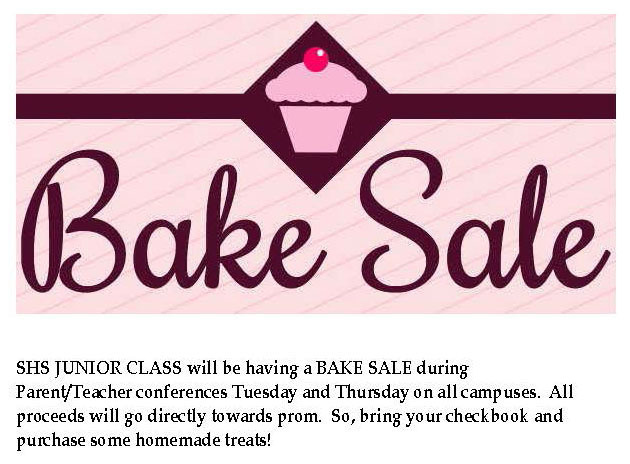 Tickets are $2 each or 2 for $3. 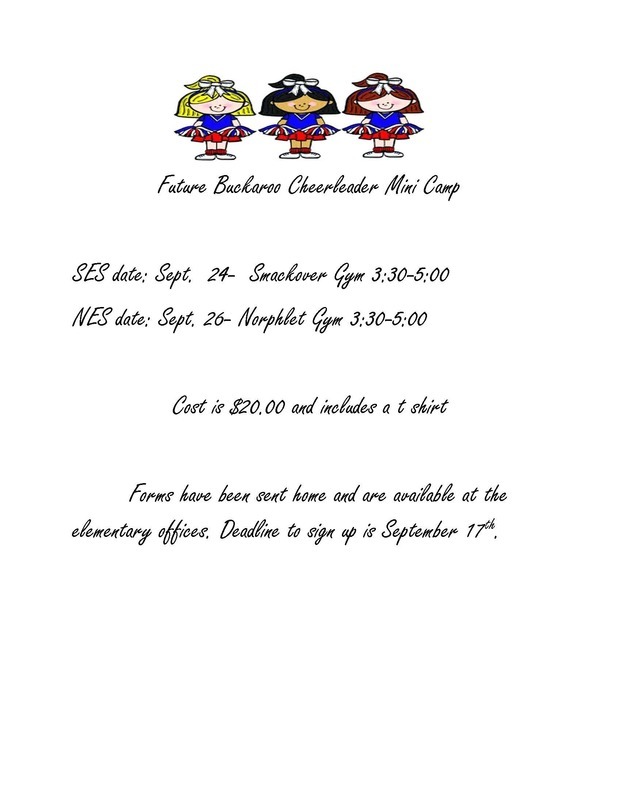 Tickets are available at home ball games or from any senior high cheerleader or cheer coach. 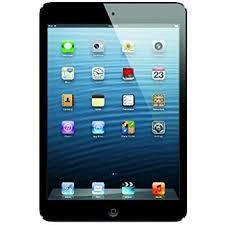 The winning ticket will be drawn at Homecoming on October 12. Fall yearbook pictures have been scheduled! * Tuesday, August 28 - Smackover Elementary School * Thursday, August 30 - Smackover High School * Thursday, September 6 - Norphlet Elementary School * Friday, September 7 - Norphlet Middle School * Thursday, September 20 - Smackover Preschool Proofs will be sent home at a later date. The Junior Tennis Clinic is now a free after school clinic for ages 10-13 from 3:30-5:30 on the afternoon of Tuesday, August 28th. 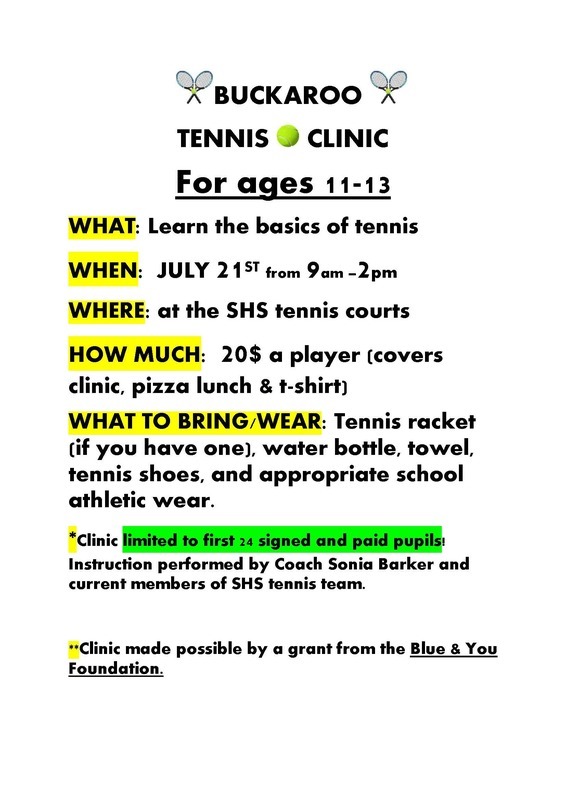 Students should report to the Smackover High School tennis courts or the SHS gym if it is raining. 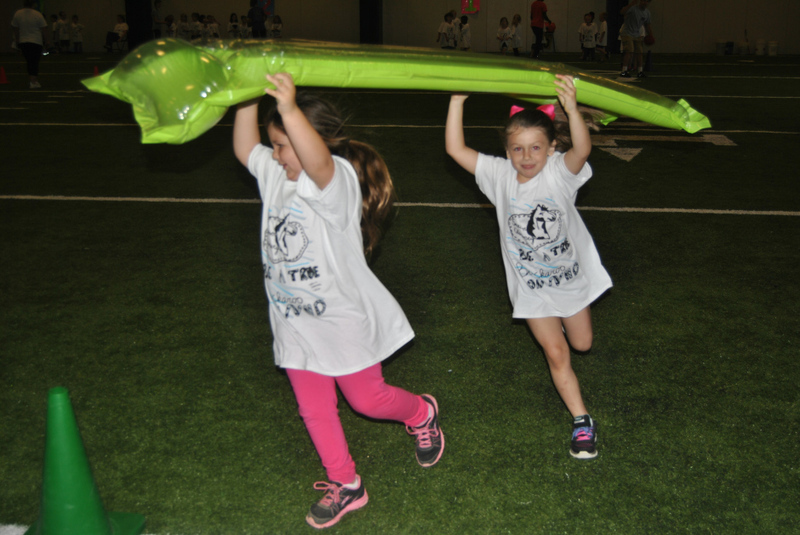 Let us introduce your child to the basics of tennis in a fun afternoon! Don't Miss the BIG Game! Buy Your Tickets NOW! Tickets are on sale NOW for the Hooten’s Kickoff Classic which will be played on Monday, August 27, at Southern Arkansas University in Magnolia at 5:30 pm. Tickets may be purchased at central office for $7. 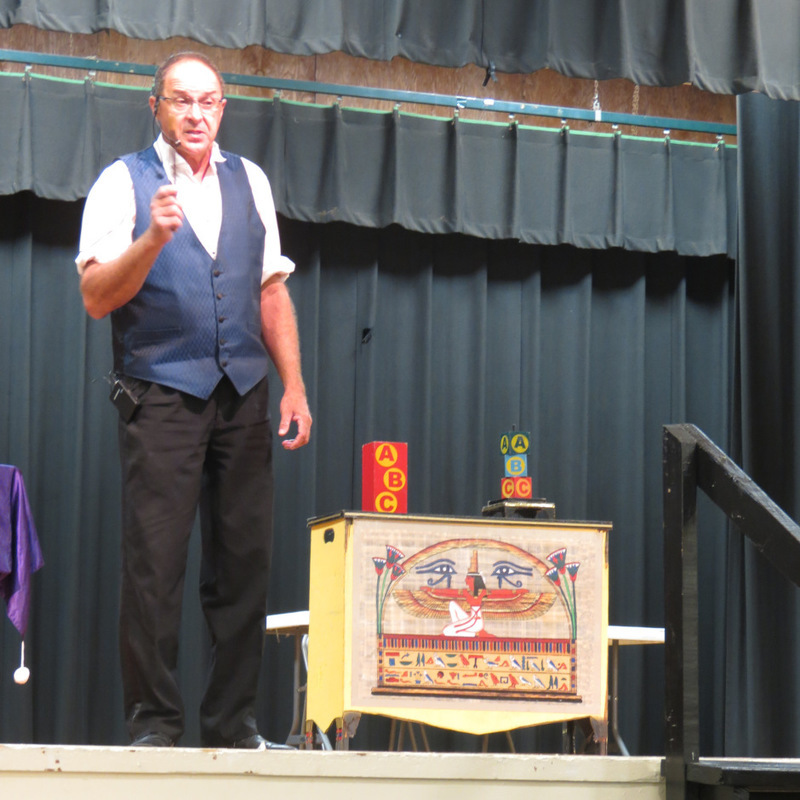 Advance ticket sales benefit the school district. 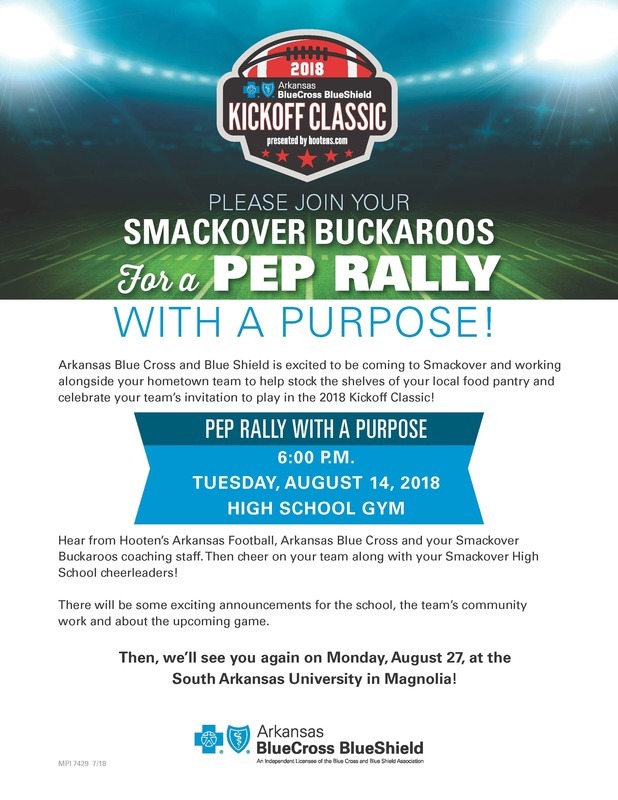 The 2018 Pep Rally with a Purpose will be held at the park in Smackover at 6 pm. Hooten's Classic Tickets on Sale! 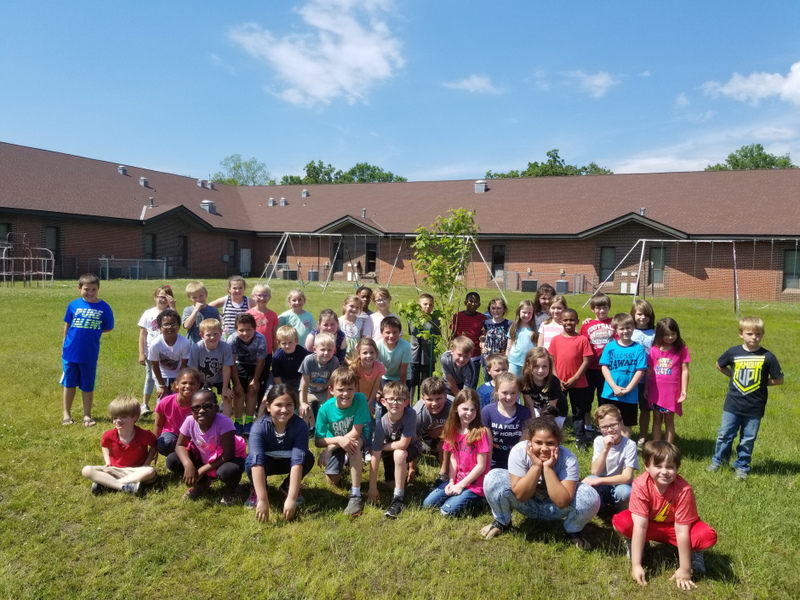 Smackover Elementary School 2nd grade students planted a tree on the playground for Earth Day! 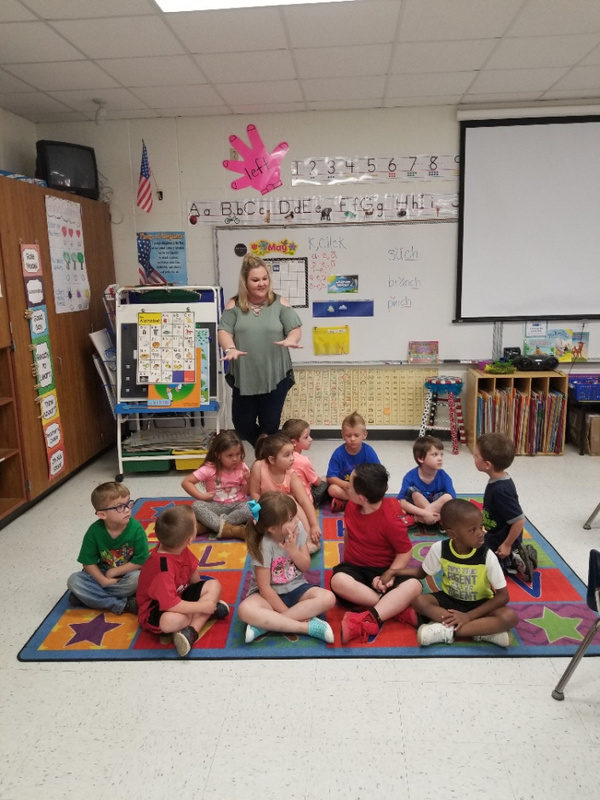 Smackover Preschool sent its future kindergarten students to Smackover Elementary School recently to learn how to be a kindergarteners. 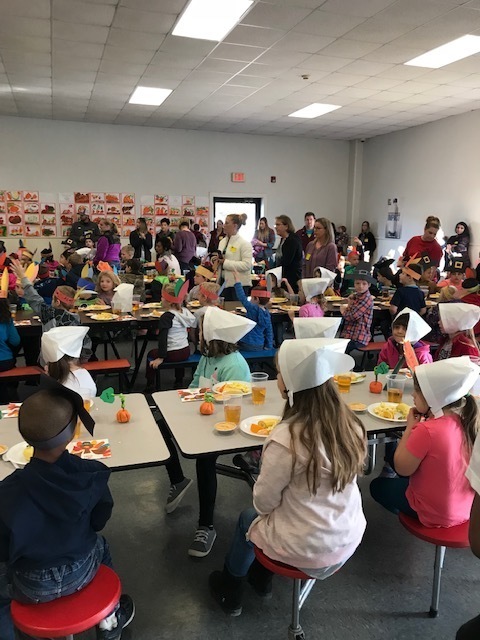 These students got to listen to a story from a kindergarten teacher, play outside on the playground with the current kindergarten students, and eat a delicious lunch in the cafeteria. 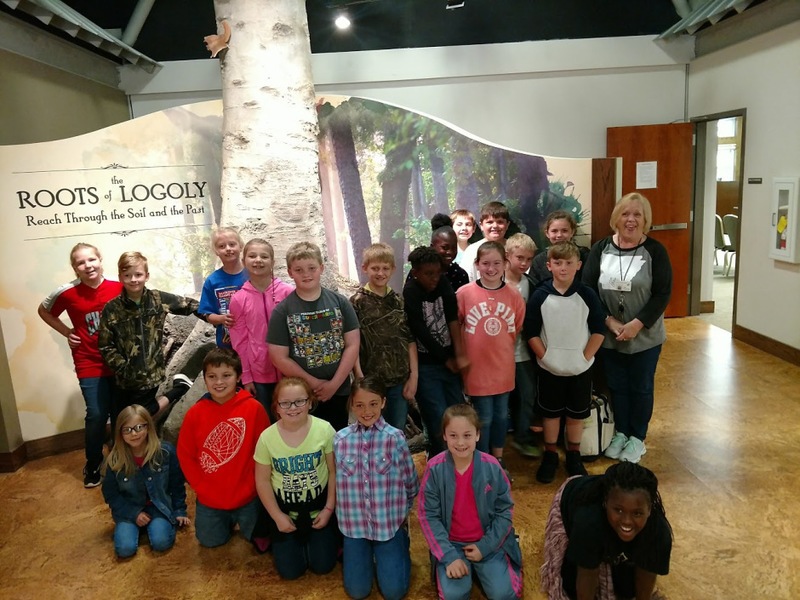 Smackover Elementary School third grade students took a field trip to Logoly State Park at the end of April. 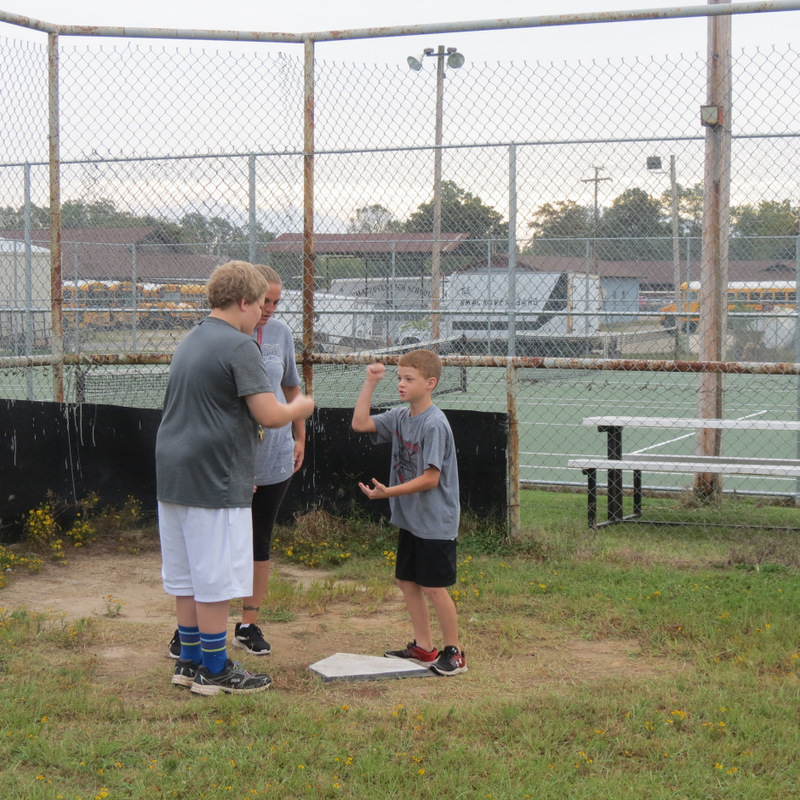 Smackover Elementary School first through fifth grade students who met their Accelerated Reader (AR) goal for the third nine weeks were rewarded with an Egg Hunt and extra recess in April. 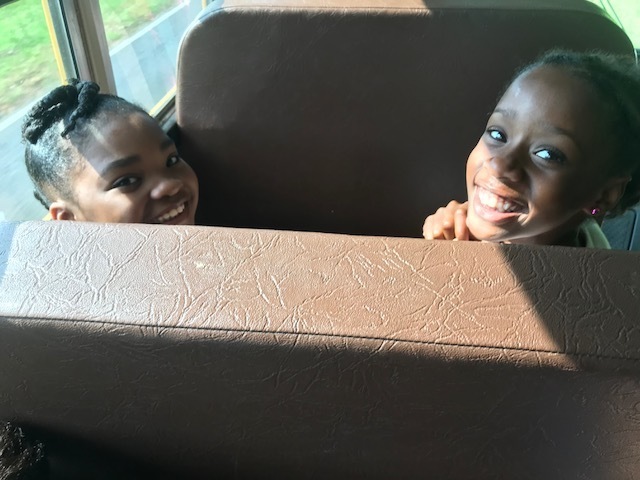 Smackover Elementary School second grade students studied the butterfly cycle by researching, observing, and journaling over the past few weeks. 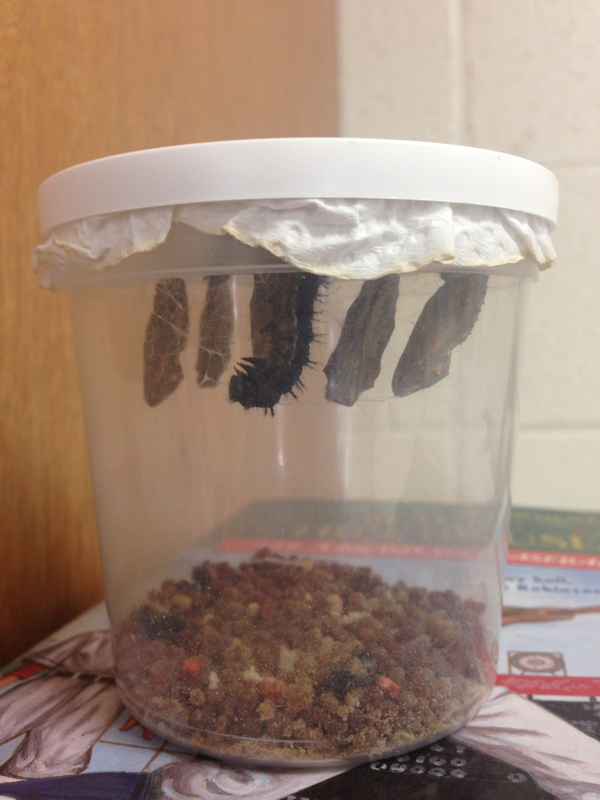 They witnessed the caterpillar changing to a pupa/chrysalis, then a butterfly. Then, they set the butterflies free. 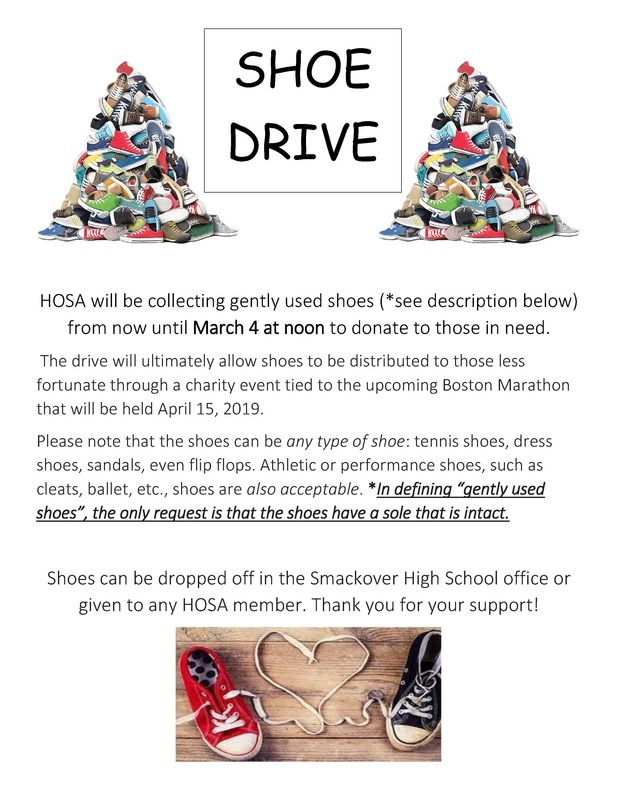 Drive 4 UR School Event This Thursday! Join us on Thursday, May 10, from 9 am - 4:30 pm at the Smackover Little League Field to participate in the Ford Drive 4UR School Event sponsored by Smackover Motor Company! Take a spin in a new Ford vehicle. 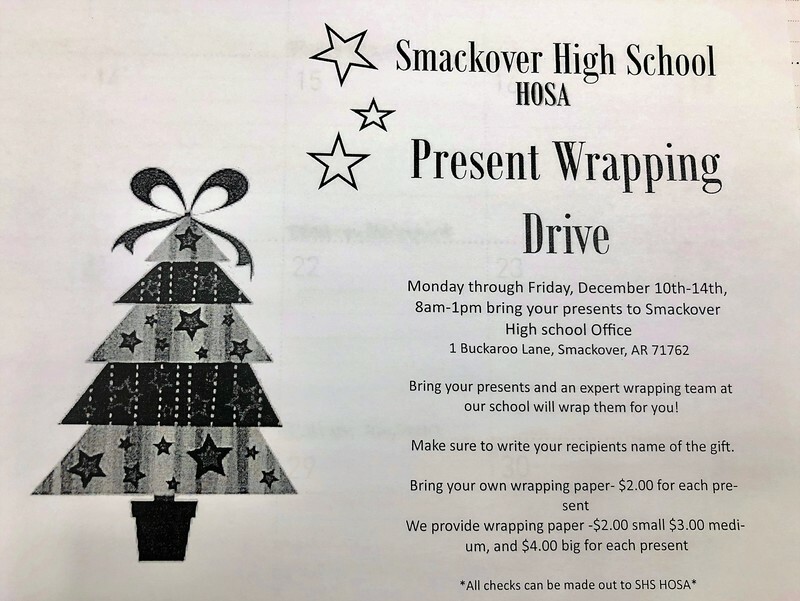 For every test drive taken, Ford Motor Company will donate $20 to the Smackover-Norphlet School District, for a total up to $6,000. 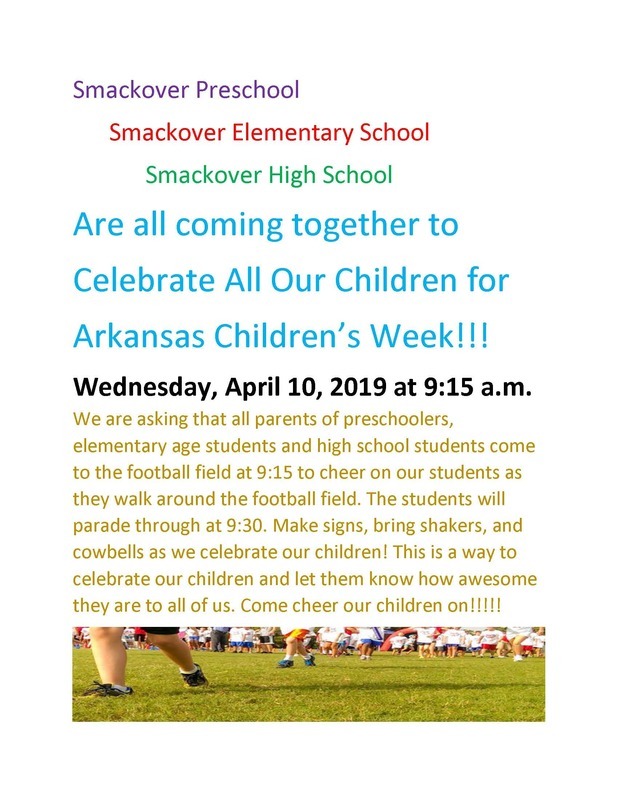 Smackover Elementary School will have a PTO meeting Thursday, May 10th, at 3:30 p.m. in the Smackover Elementary School Library. 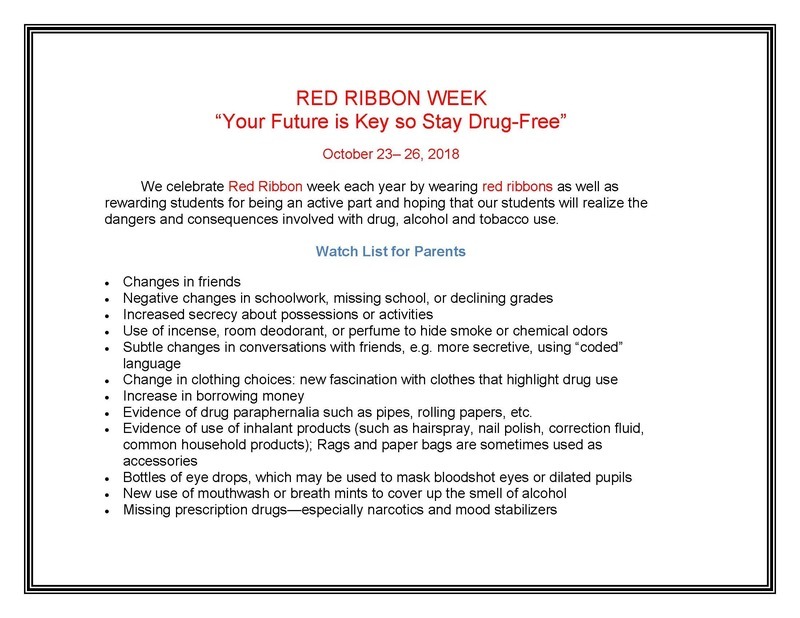 Parents and teachers are invited to attend. Order Your NES/SES Yearbook NOW! 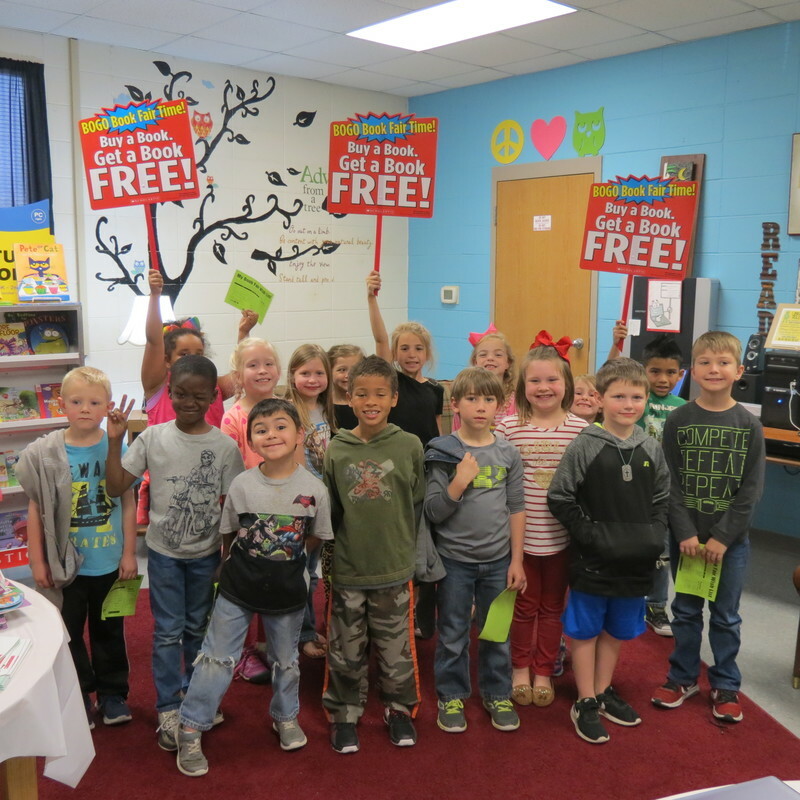 Smackover Elementary School will host a Buy One Get One Free book fair during the week of April 16-20. 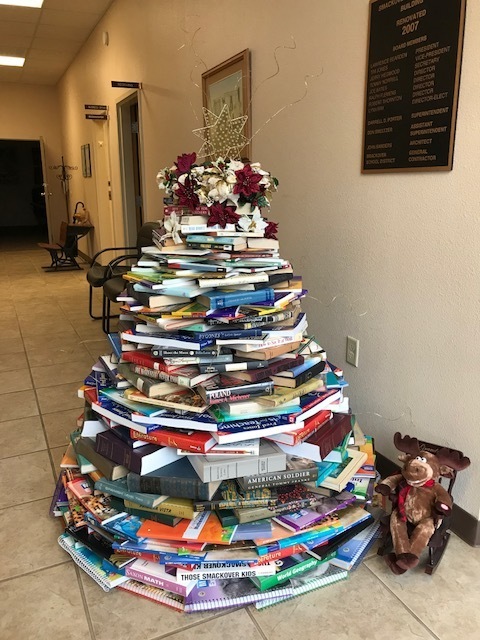 The theme for the week will be "Snuggle Up With a Good Book." Students can wear their pajamas on their library day! 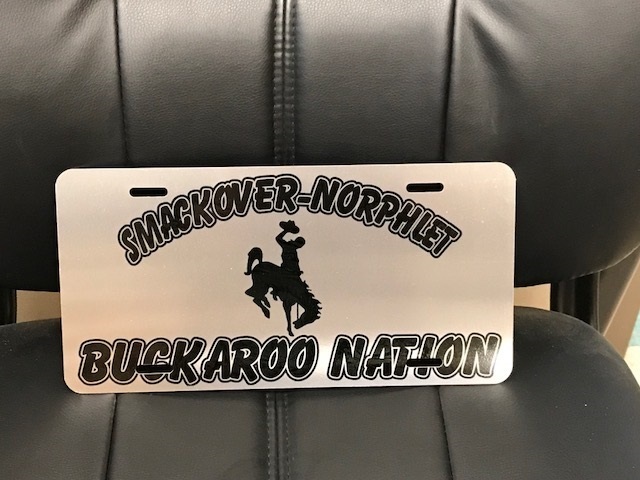 The Junior High Cheerleaders are selling Buckaroo Nation license plates for $15.00. 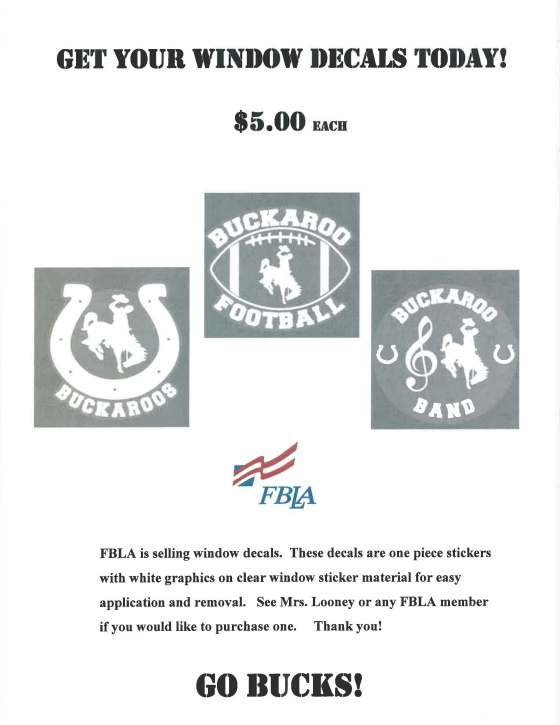 Please contact Stacy Jerry or Carly Weaver to purchase yours today. Go Bucks!! 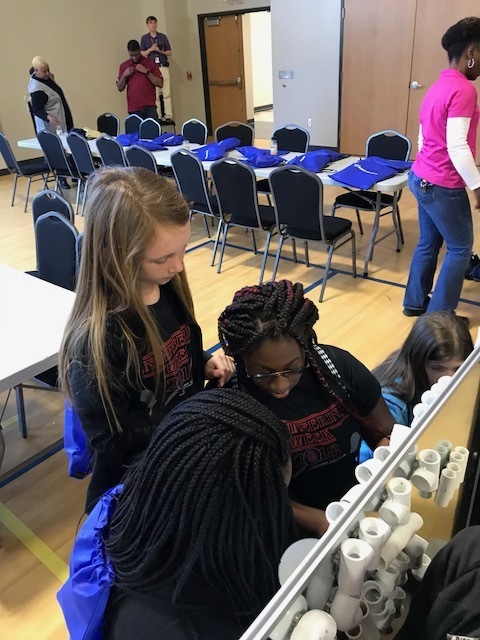 Sixty second through eighth grade girls in the Smackover-Norphlet School District got to participate in STEM activities sponsored by Lockheed Martin during their annual eWeek. 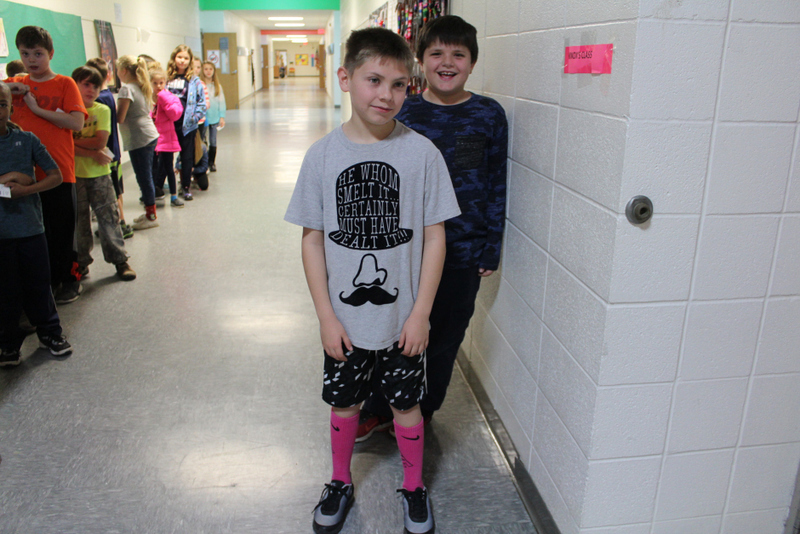 Smackover Elementary School students participated in activities last week during Read Across America Week including book character dress up day, crazy sock day, and more! 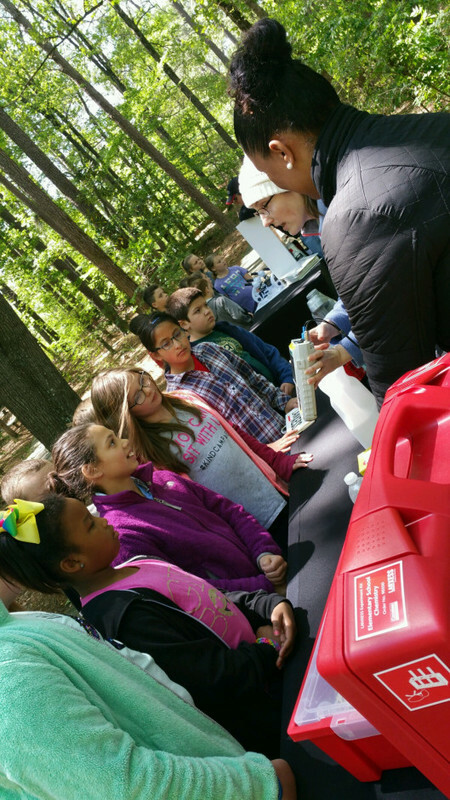 Lockheed Martin hosted its annual eWeek activities this week. 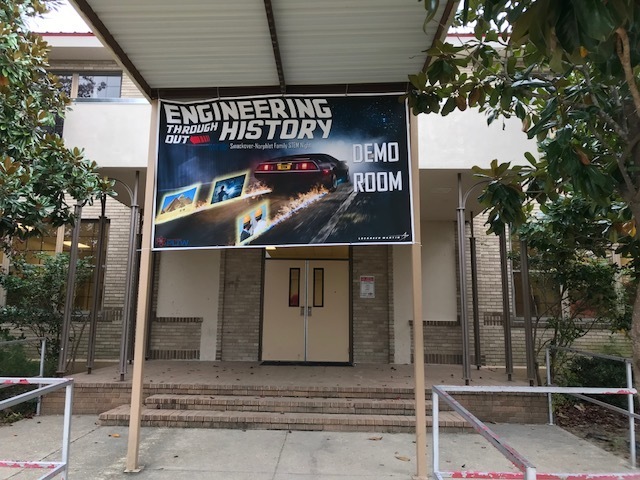 Sixty 2nd through 8th grade boys in the district were chosen by their teachers to participate in a variety of hands-on STEM activities designed to encourage problem solving and introduce students to the world of engineering. The Little Miss Derrick and Jr./Miss Derrick Pageants will be held on March 31, 2018. 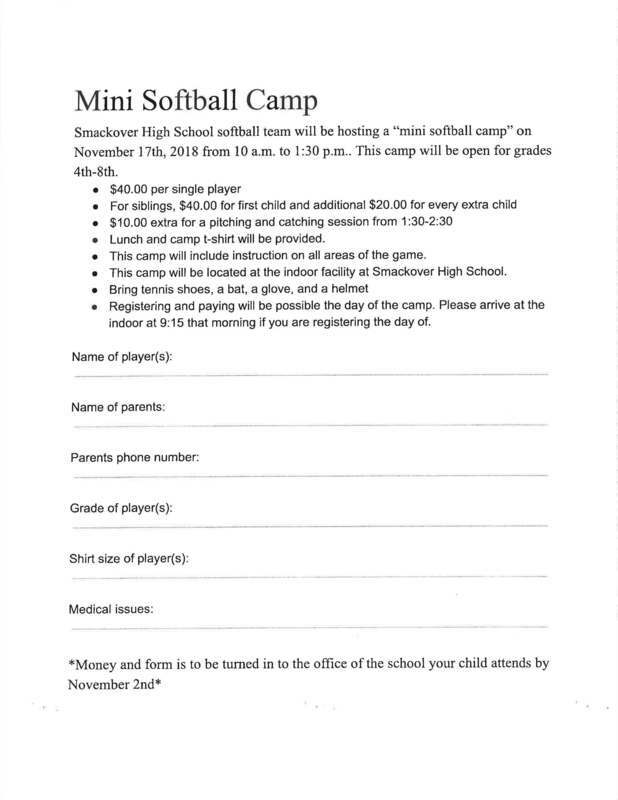 Entry forms can be picked up in the offices of each school or on the website or by contacting Tonya Corley at 725-3101. Please mark the following dates on your calendars: Monday, February 26 - Board Meeting (5:30 pm)March 19 - March 23 - Spring Break (NO SCHOOL)Monday, April 30 - NO SCHOOLFriday, May 25 - Last Day of School Beginning in March, regularly scheduled board meetings will be held on the second Tuesday of every month at 5:30 pm in the board room at central office. The Little Miss Derricks and Jr./Miss Derrick Pageants will be held on March 31, 2018. Links to the Entry forms are below. Little Miss Derrick Pageants Entry Form, 2018Miss Derrick Pageant Entry Form, 2018Entry forms can also be picked up in the offices of each school. 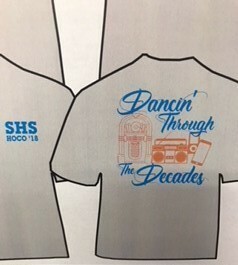 For more information, contact Tonya Corley at SHS (725-3101). 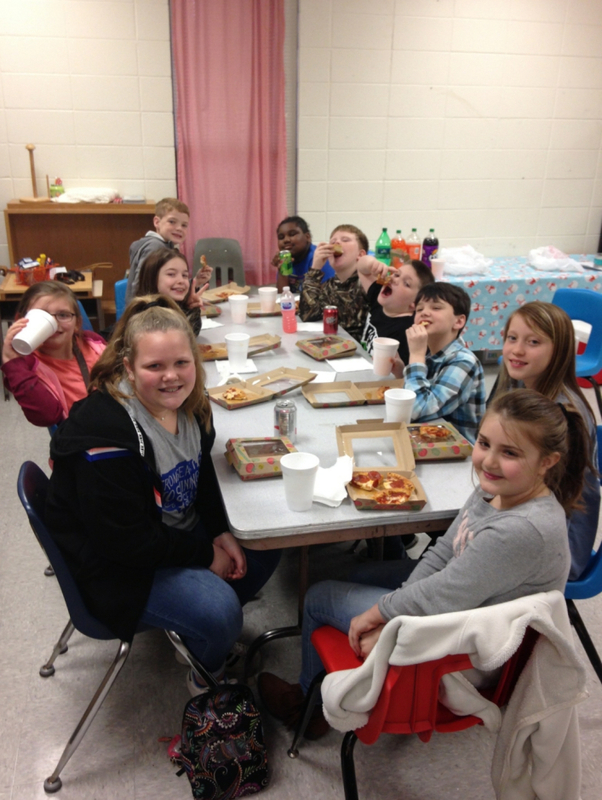 Third and fourth grade GT students competed at Quiz Bowl last week. Quiz Bowl was held at SAU Magnolia. 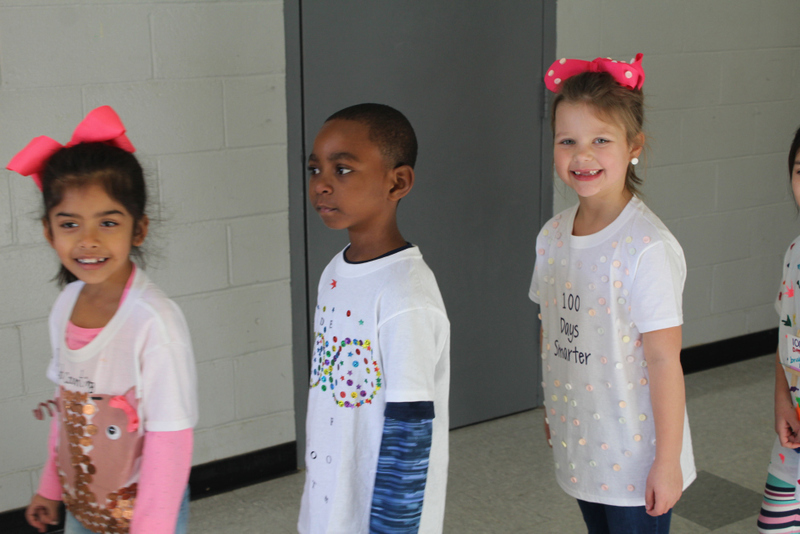 Smackover Elementary School first and second graders celebrated the 100th day of school last week by participating in a parade at the high school. 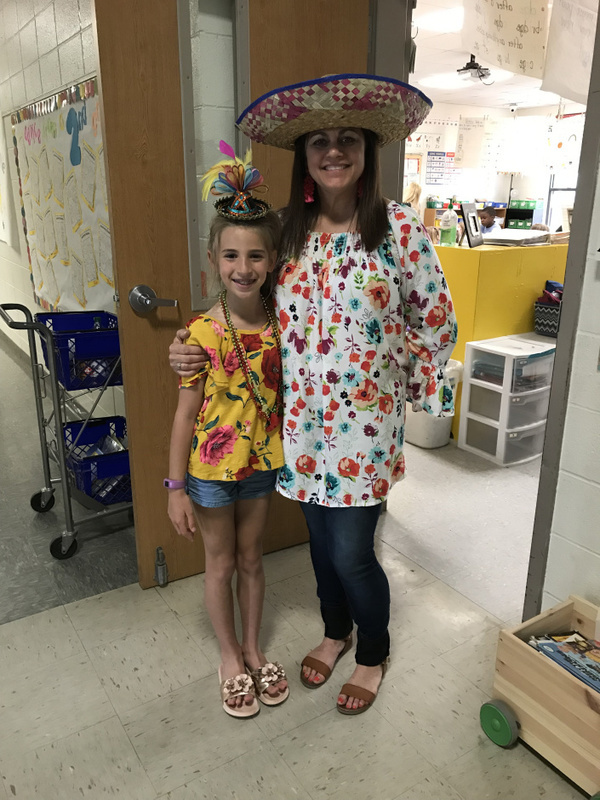 First graders wore hats that they decorated with 100 items. 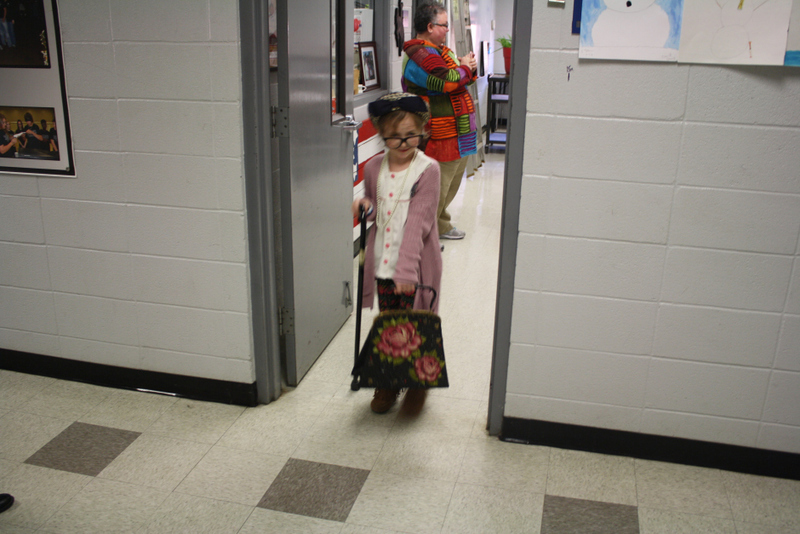 Second graders dressed up like 100 year olds! It Is School Board Recognition Month! 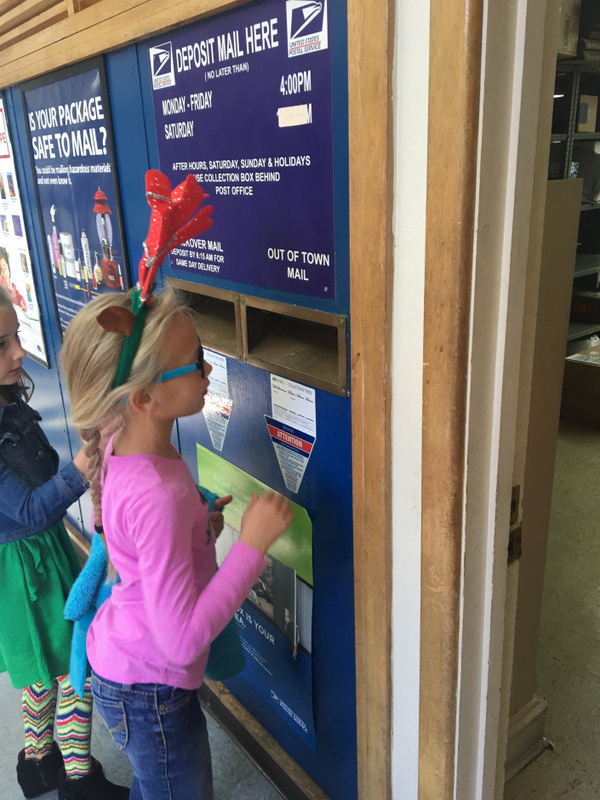 Second grade students at Smackover Elementary School wrote letters to Santa back in December and then took a walking field trip to the post office to officially mail the letters! 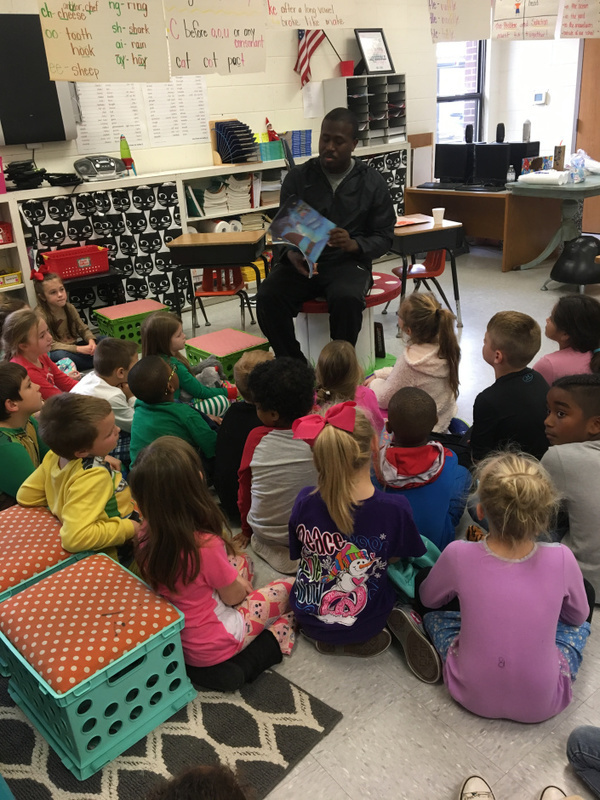 Special VIP visitor Coach Patrick House stopped by Smackover Elementary School to read a Christmas book to 2nd graders on their last day before Christmas break. Congratulations to Kaden Thompson for winning the Smackover Elementary School spelling bee! Runner-up was Janelle Drummond. 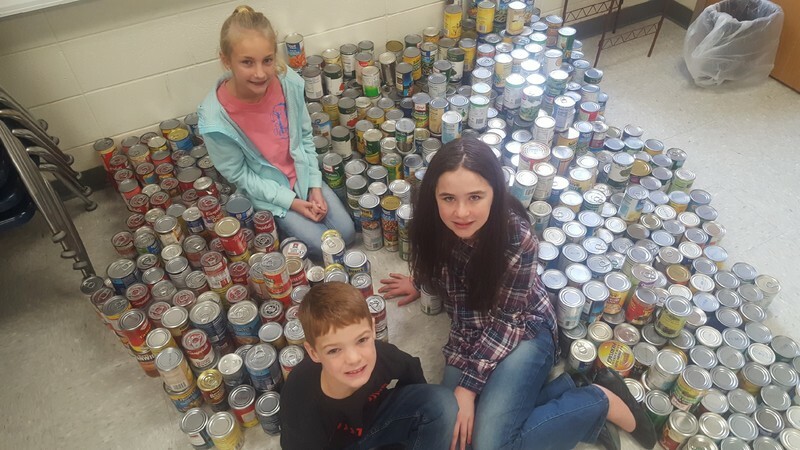 Abby Fogle, Judson Wolfe and Madison Ham of Smackover Elementary School Student Council show off the 1007 cans that were collected in this month's food drive. 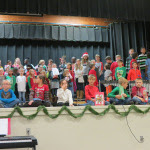 SESThe second and third graders at Smackover Elementary School presented a Christmas program last Tuesday. 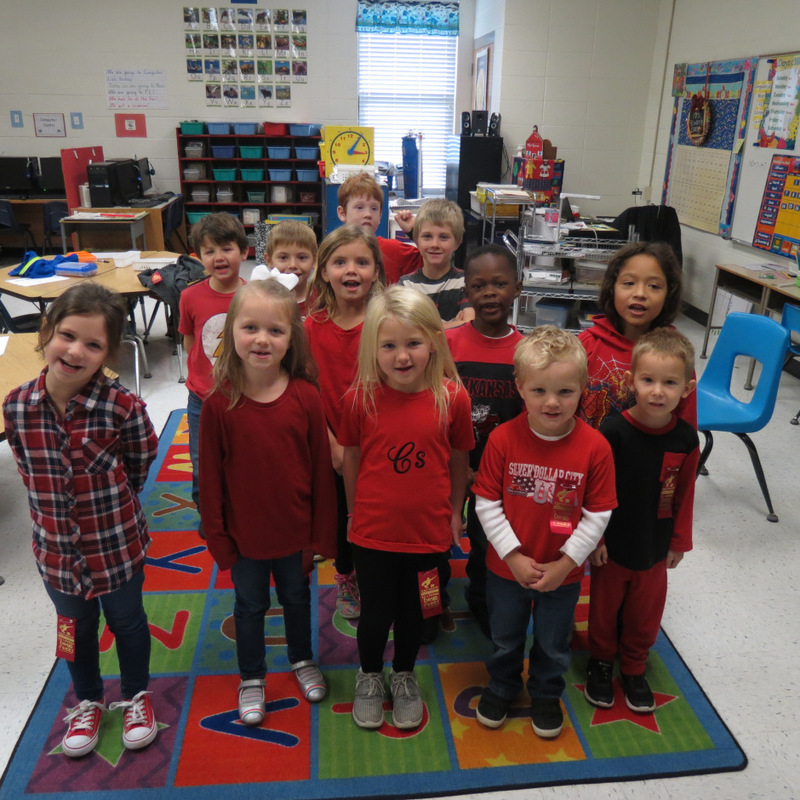 Smackover Elementary School kindergarten students went on their annual Christmas caroling on Monday. 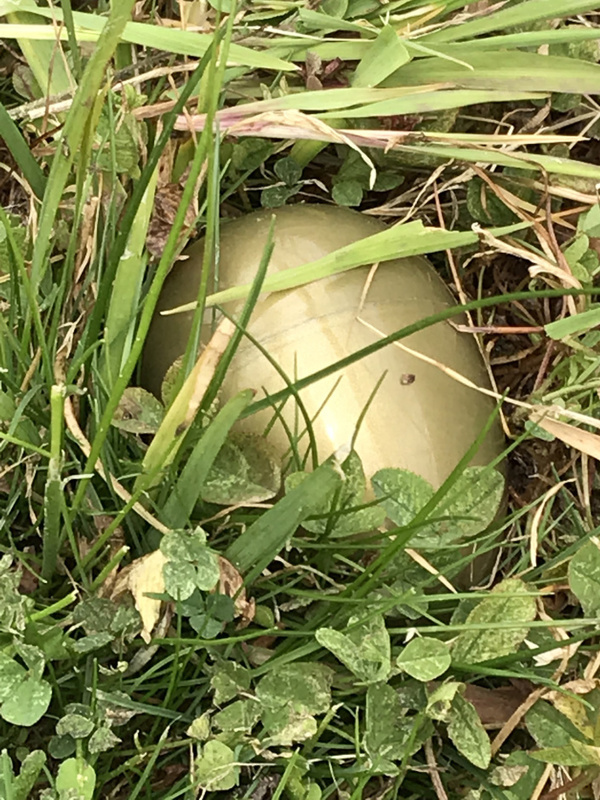 No Turkey Hunting at SES! 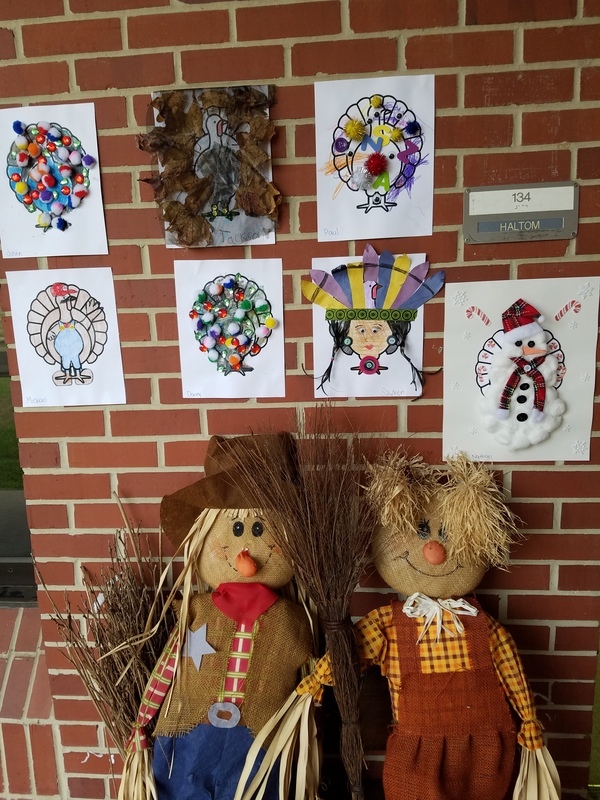 Mrs. Haltom's students at Smackover Elementary School decorated turkeys by putting them in disguise to protect them this Thanksgiving! Can you find the turkeys in the picture below? 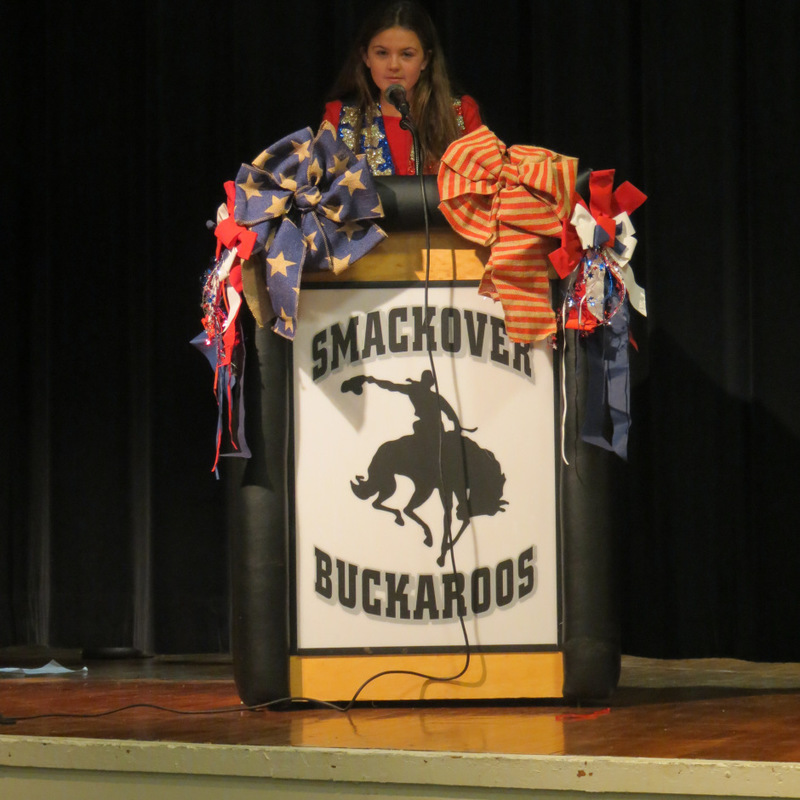 Smackover Elementary School students participated in a Veteran's Day Assembly to honor all of the men and women who have served in the armed forces to protect our country. 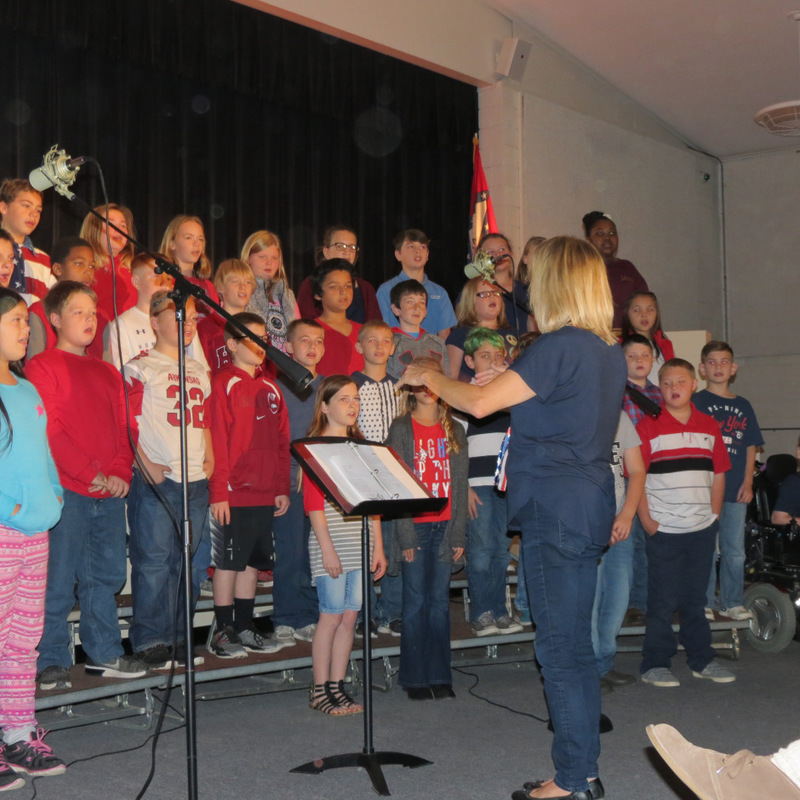 Mrs. Wood's 5th grade music classes and Mrs. Long's Student Council students performed songs and poems in front of United States Veterans on Friday, November 10. We thank them for their service. 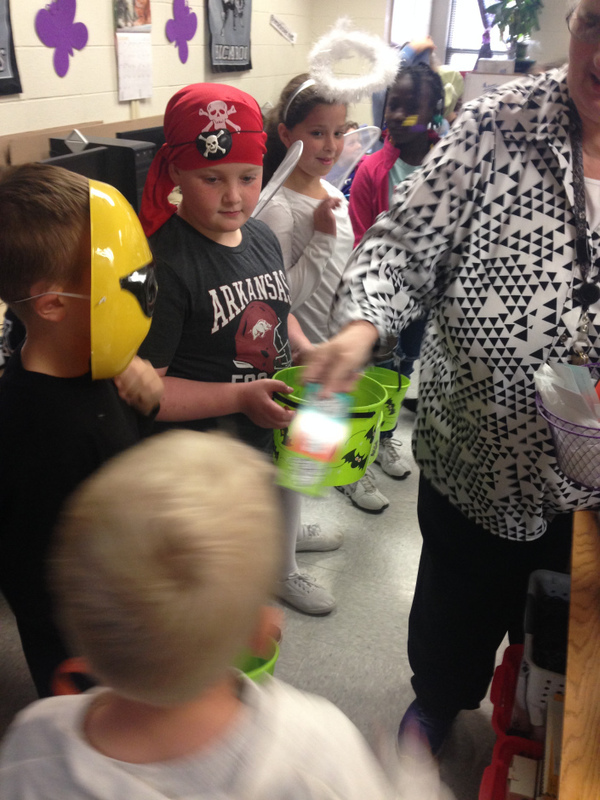 Smackover Elementary School students who met their AR goal in the 1st nine weeks were rewarded last week on Halloween. 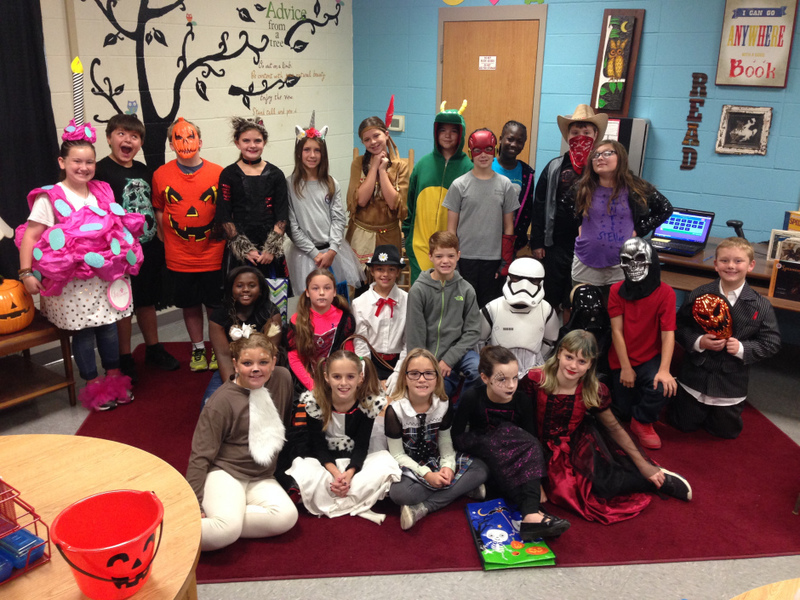 Theses students got to wear their Halloween costumes to school and go around to the classrooms trick or treating. Then we danced to some Halloween music in the library. 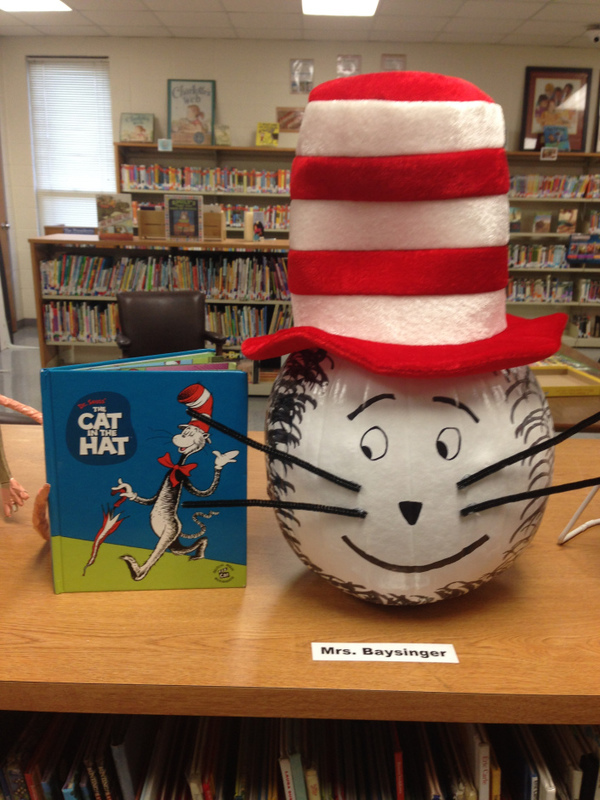 Smackover Elementary School students and teachers recently created book character pumpkins. 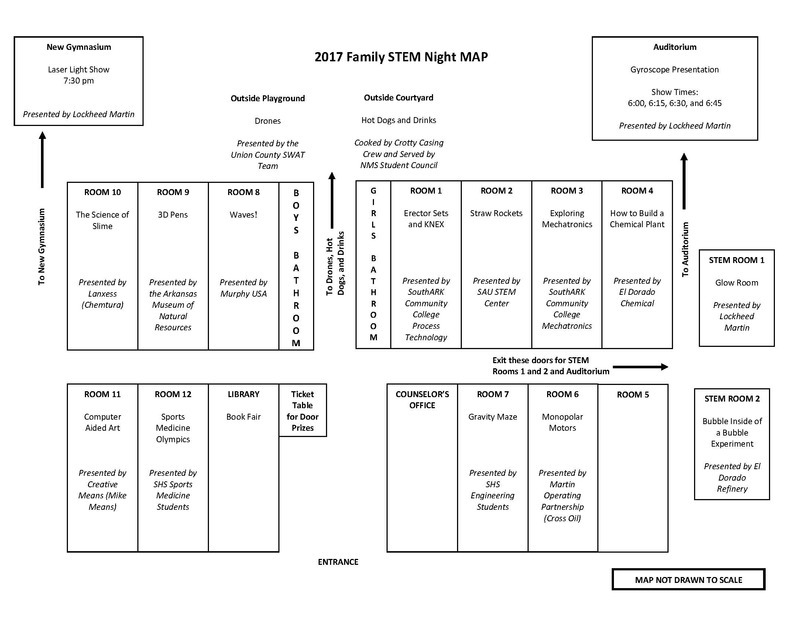 The 3rd Annual Family STEM Night for K-12 grade students will be held Tuesday, November 7, 2017, from 5:45 – 8 pm at Norphlet Middle School. This evening is going to have lots of super fun activities, a laser light show, free food, and cool door prizes! Check out the brochure below to find out about all of the exciting activities which will be available that evening! 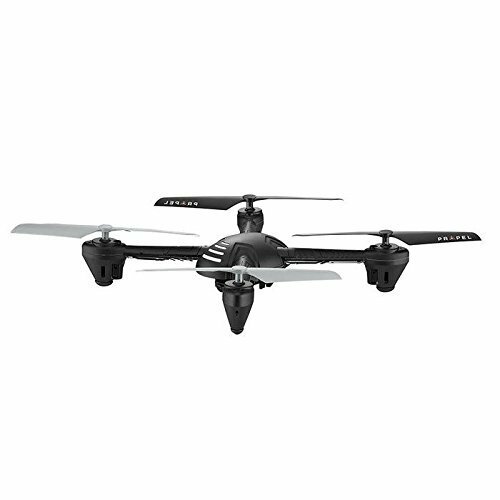 Check Out this NEW Door Prize for Family STEM Night! 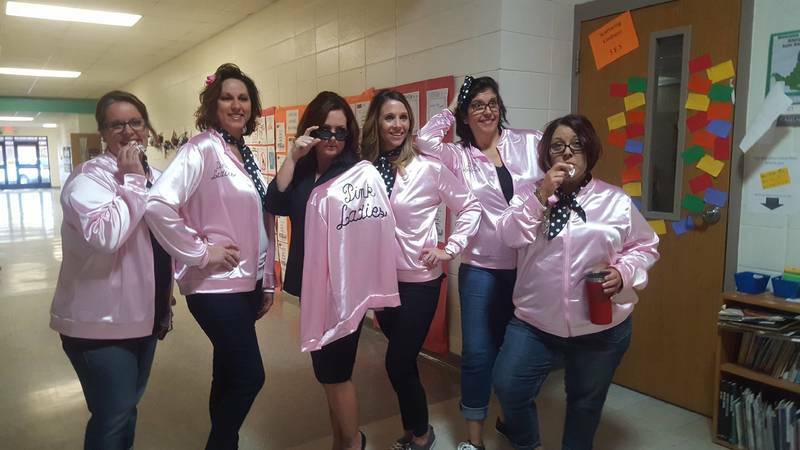 SES Students and Teachers showed off their school spirit and support of Red Ribbon Week by dressing as Movie Characters. 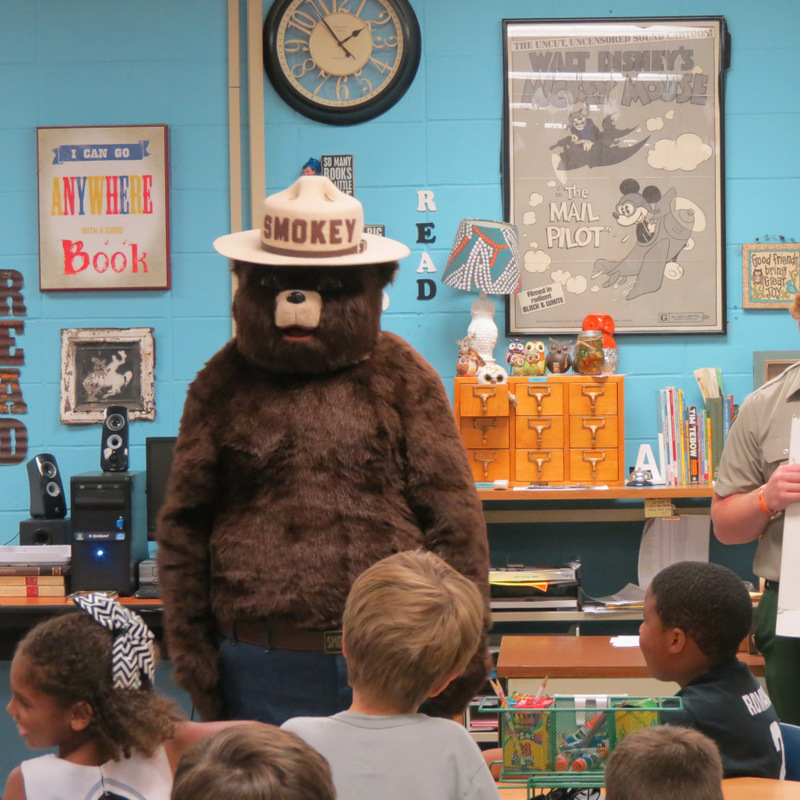 Smokey the Bear and the Arkansas Forestry Commission visited Smackover Elementary School 2nd grade students last week. A book was read about preventing forest fires. 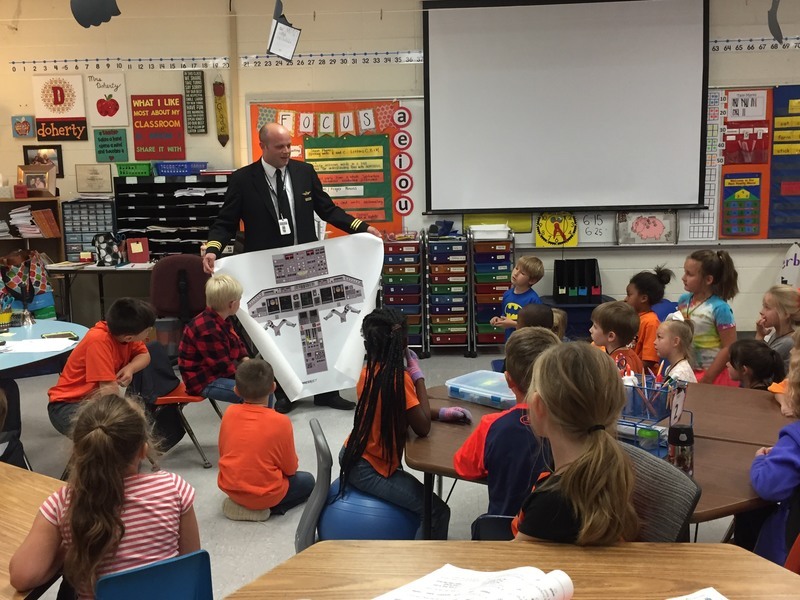 James Beebe, a pilot for Delta Airlines, came and spoke to 1st graders during career week. 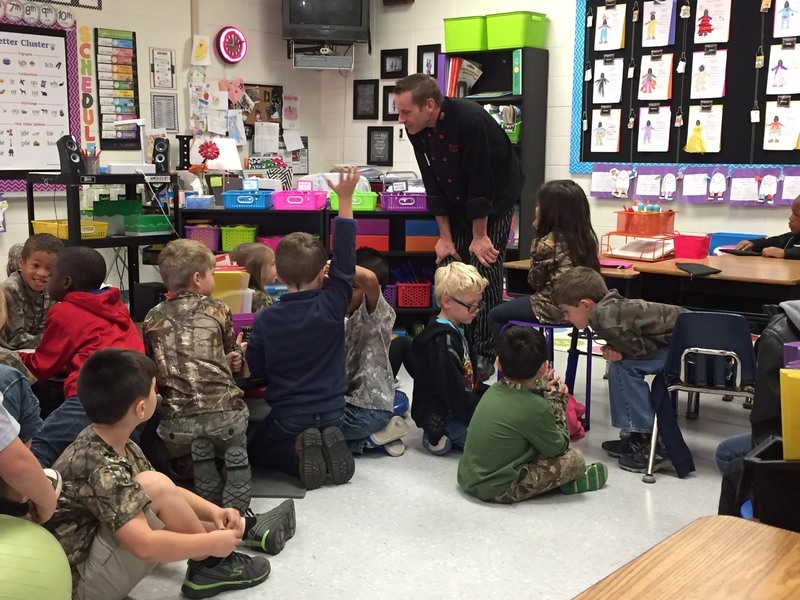 SES First Grade students are studying various Careers this week. As a part of this unit, Chef Tyler from Postmasters in Camden came to speak to the students about his job as a Chef. 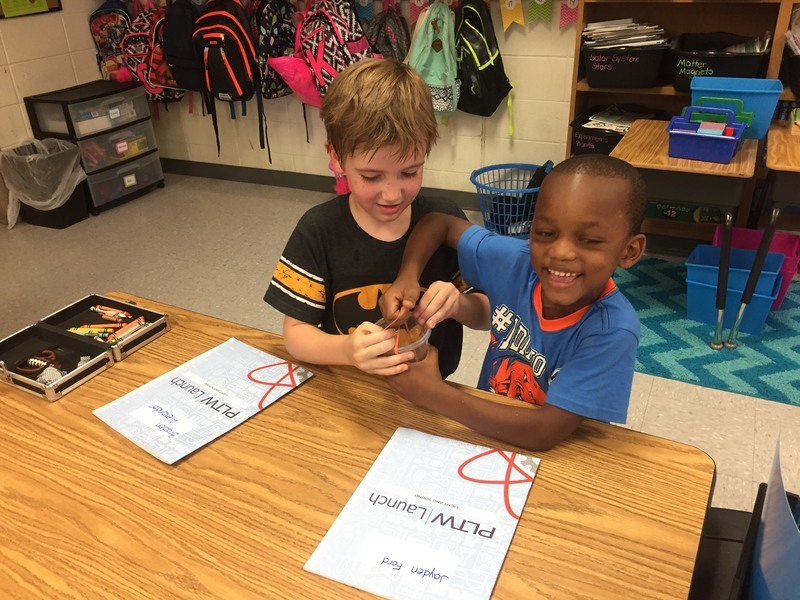 Mrs. Jennifer Baysinger's kindergarten students at Smackover Elementary School just completed their PLTW STEM module: Structure and Function. 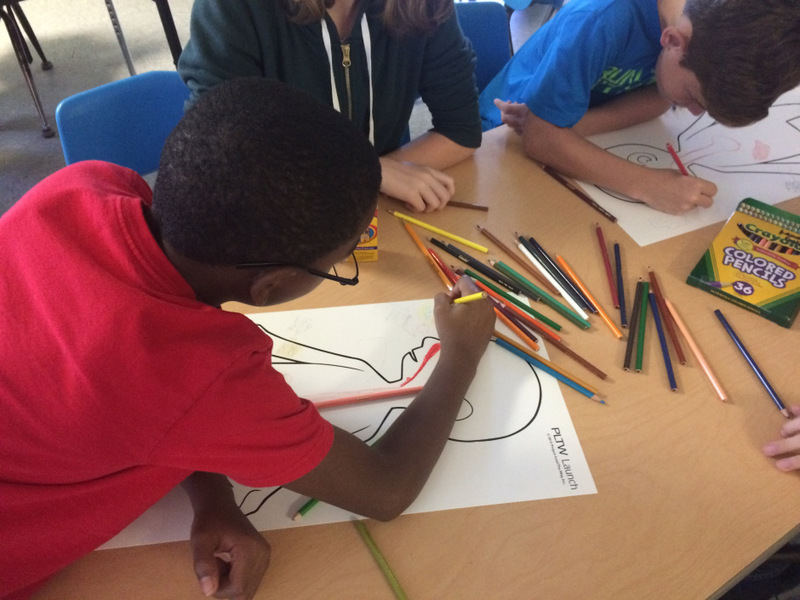 The students explored the engineering design process and created their own paintbrushes. 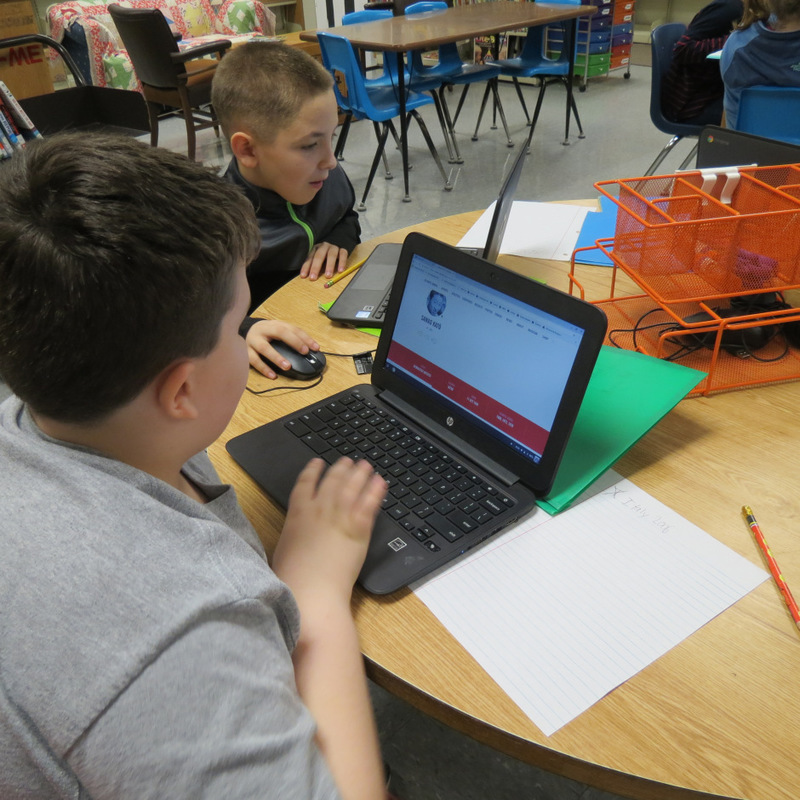 Fifth grade students in Mrs. Kelly Arrington's science class at Smackover Elementary School are participating in the PLTW module, Infection Detection. Through this module, the students are doing an immune system study. 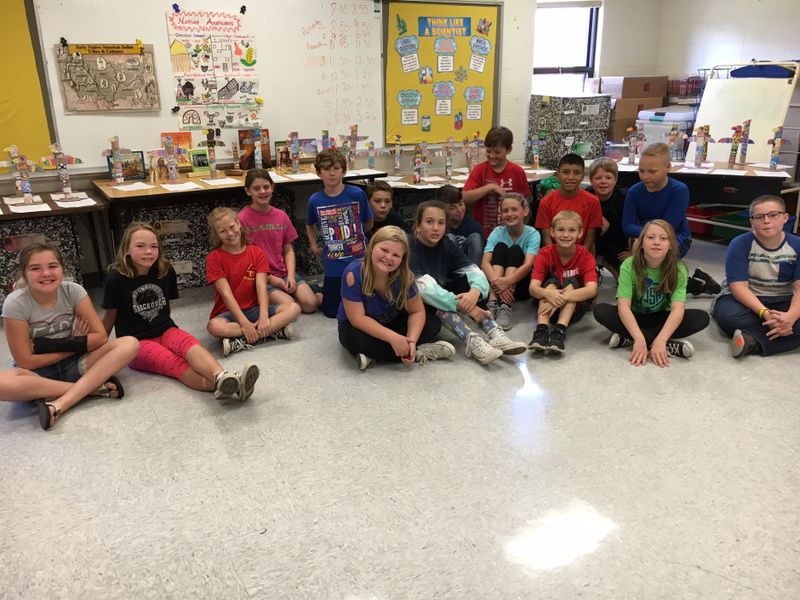 Fifth grade students in Mrs. Tina Stringer's social studies classes at Smackover Elementary School made totem poles and wrote a narrative explaining the raising of their totem poles during a potlatch, the meanings of their animals, and how the potlatch ended. 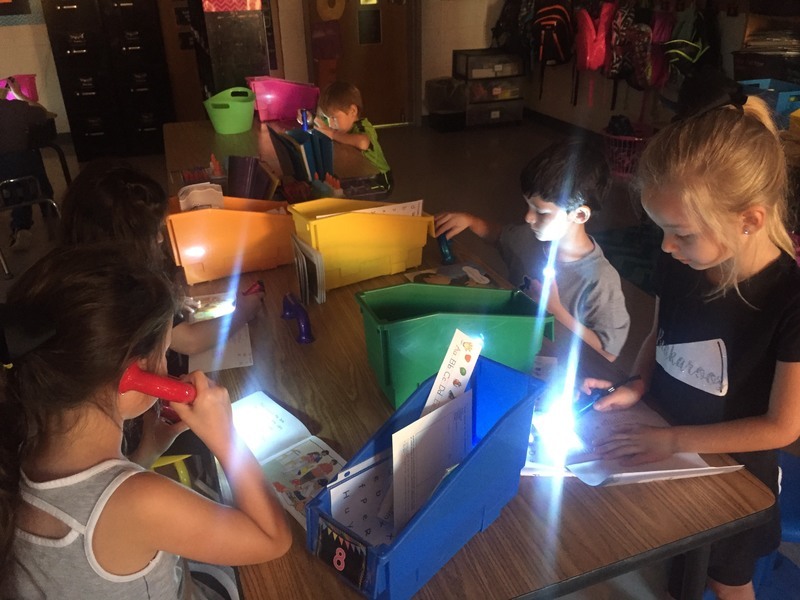 SES 1st Graders make reading extra special by having Flashlight Fridays. These students read for 15 minutes every Friday by flashlight. 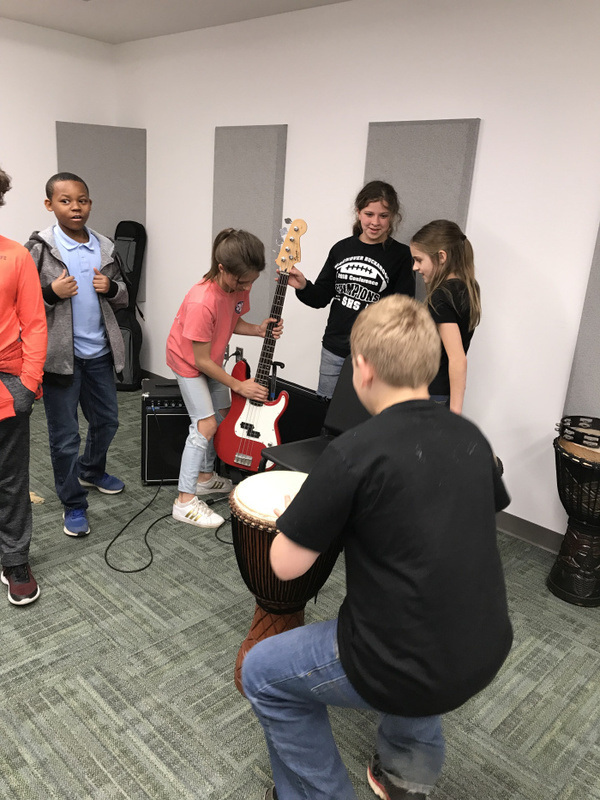 SES First Grade students have been studying Sound for PLTW. 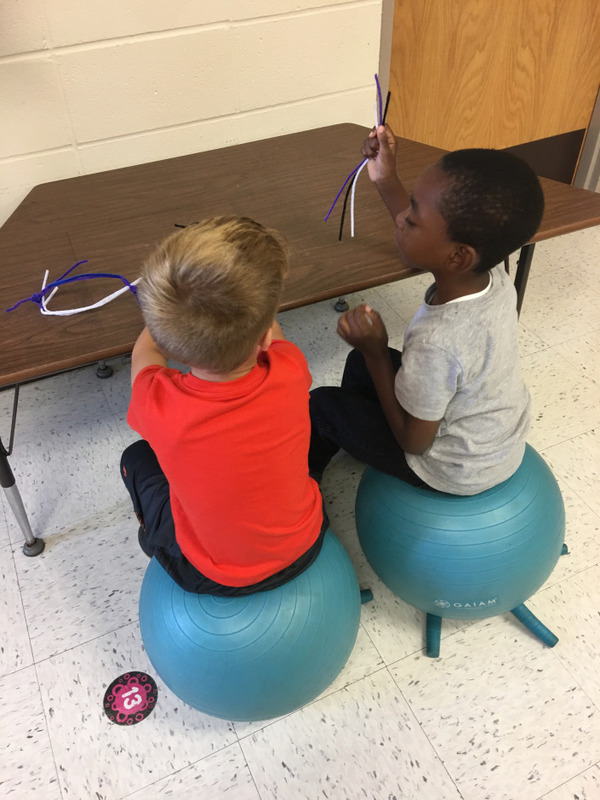 In the photo, students worked on creating sound vibrations with rubber bands. 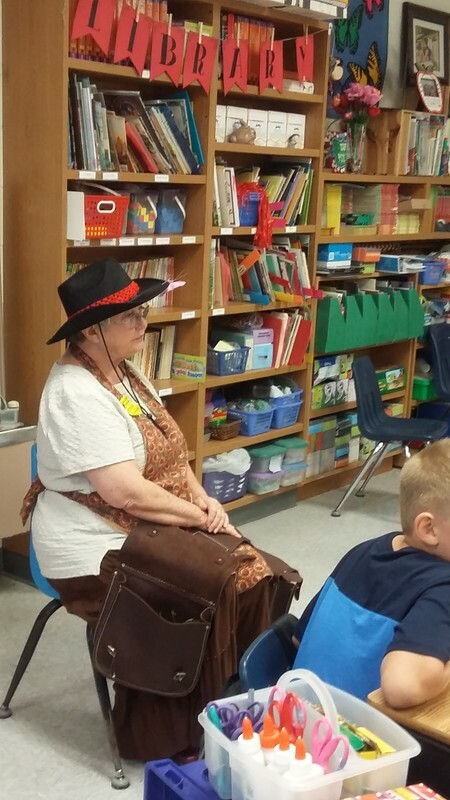 Terry Simpson, posing as Susan Carver, shares a lesson on Making a Difference with third grade students at Smackover Elementary. The book The Kid Who Changed the World was also presented to the library. 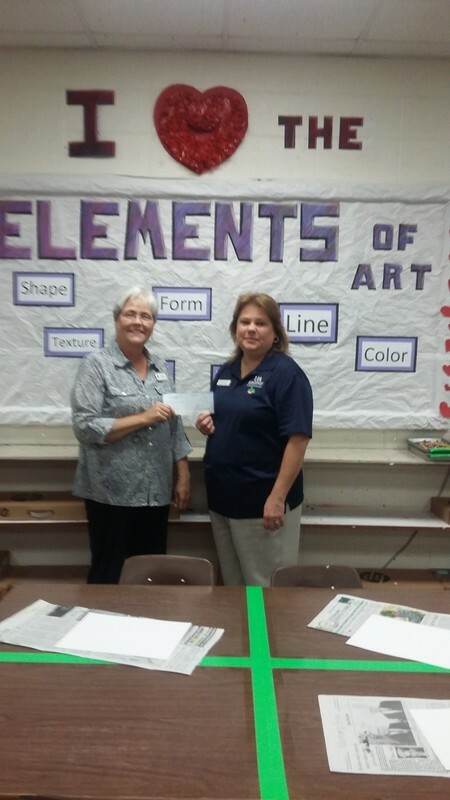 Cherrie Sweeney of the Union County Farm Bureau Women's committee presents SNSD elementary art teacher, Lauralyn Ramsey, a check for use in the arts. The Norphlet Flu Shot Clinic will be held on October 10. 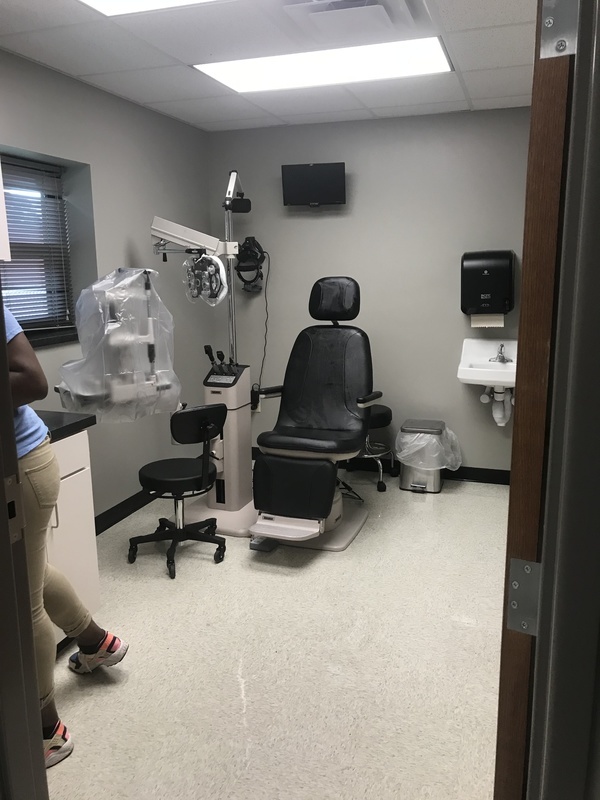 The Smackover Flu Shot Clinic will be held on October 19. Forms have been sent home with students. 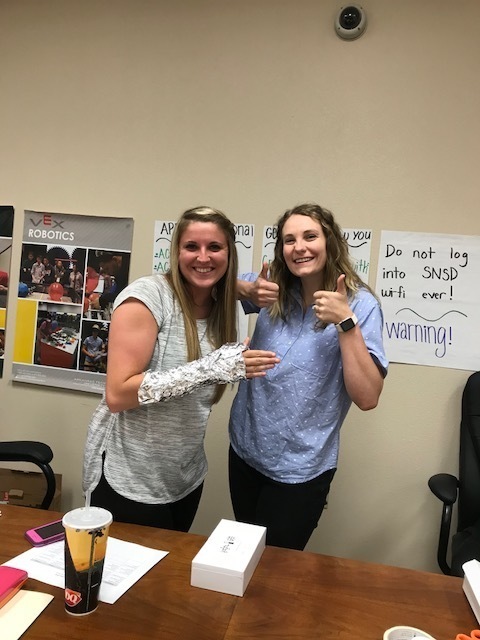 If you did not receive a form or if you have any questions about the flu shot clinic, please contact Traci Jeffers at Norphlet or Candis Langley at Smackover. 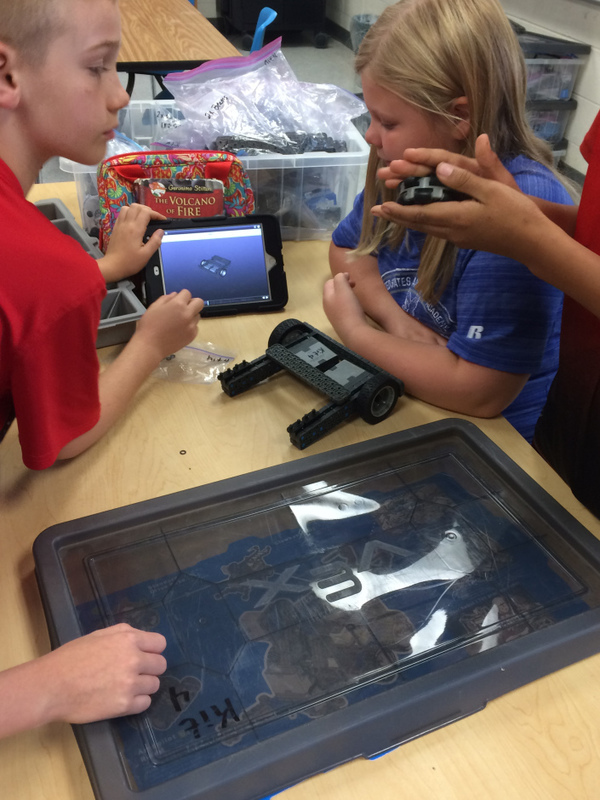 Smackover Elementary School fourth graders worked on projection involving energy and collisions while fifth grade students built robots! 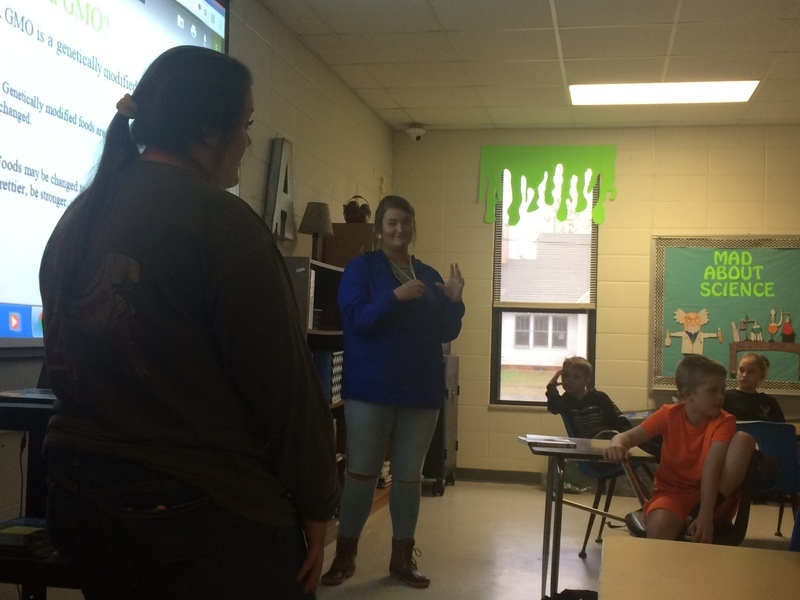 Mrs. Kelly Arrington teaches both 4th and 5th grade science at Smackover Elementary School! 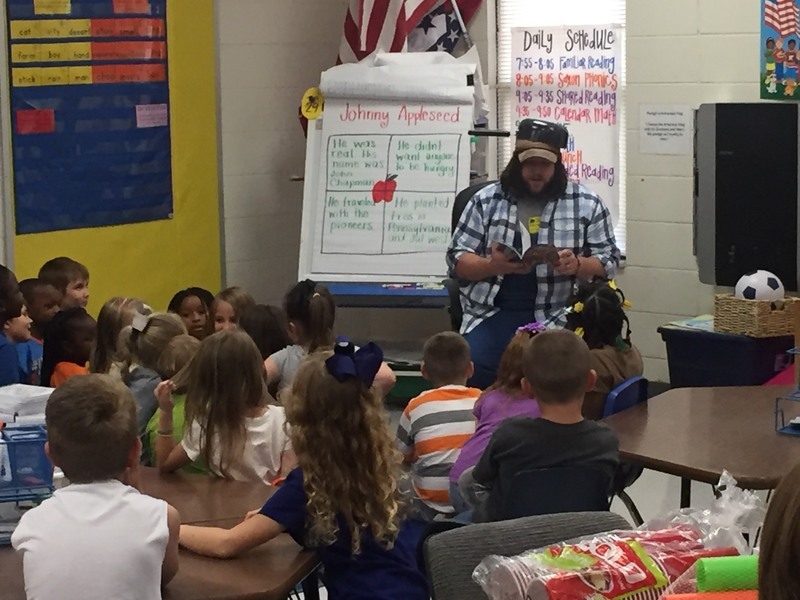 Johnny Appleseed recently came to visit First Grade at SES. 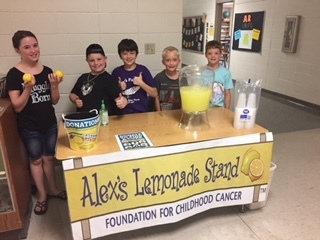 GT students at Norphlet Elementary School and Smackover Elementary School had a lemonade stand on both campuses during parent teacher conferences to support the Alex's Lemonade Stand Foundation for Childhood Cancer fundraiser. $268 was raised. Thank you to everyone who donated! 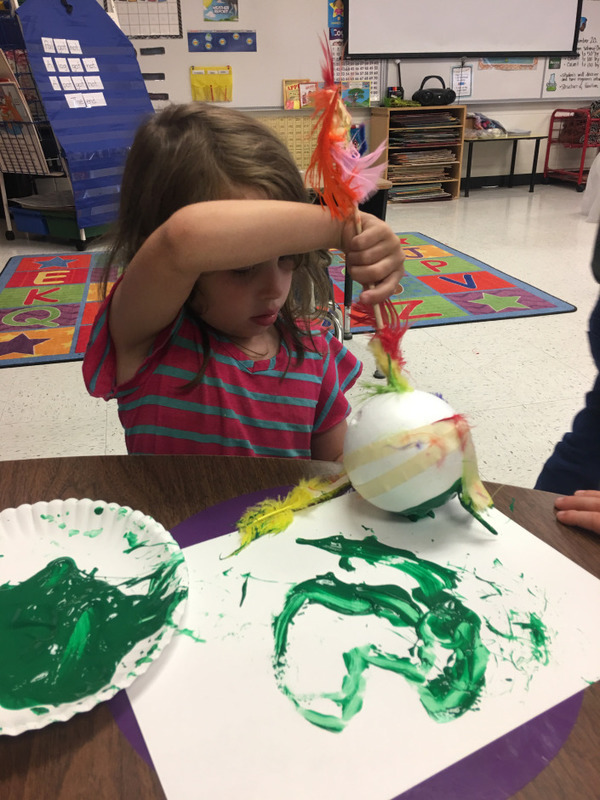 Kindergarten students in Mrs. Jennifer Baysinger's class built a beanstalk and tested their ability to hold a "golden egg". 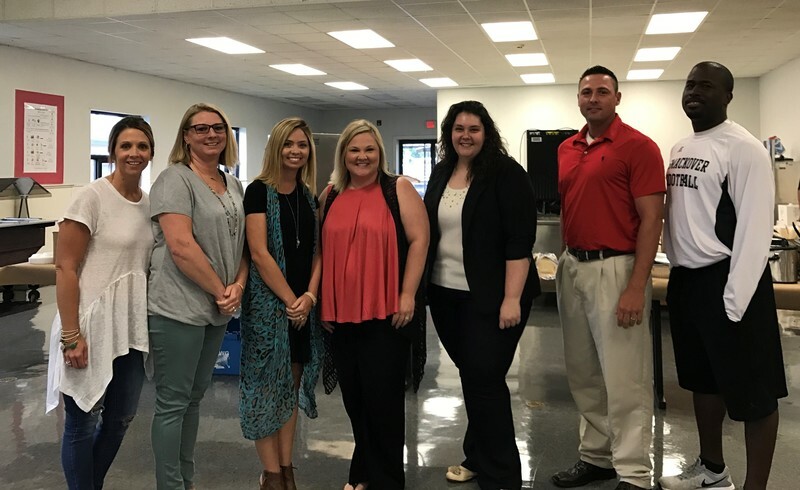 The Smackover-Norphlet School District debuted its new website at the beginning of the school year. We are seeking input from students, parents, and community members regarding the new website so that we can make our website better! 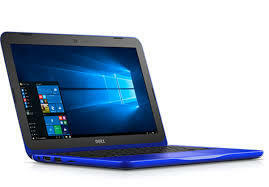 Please click here to take the website survey. 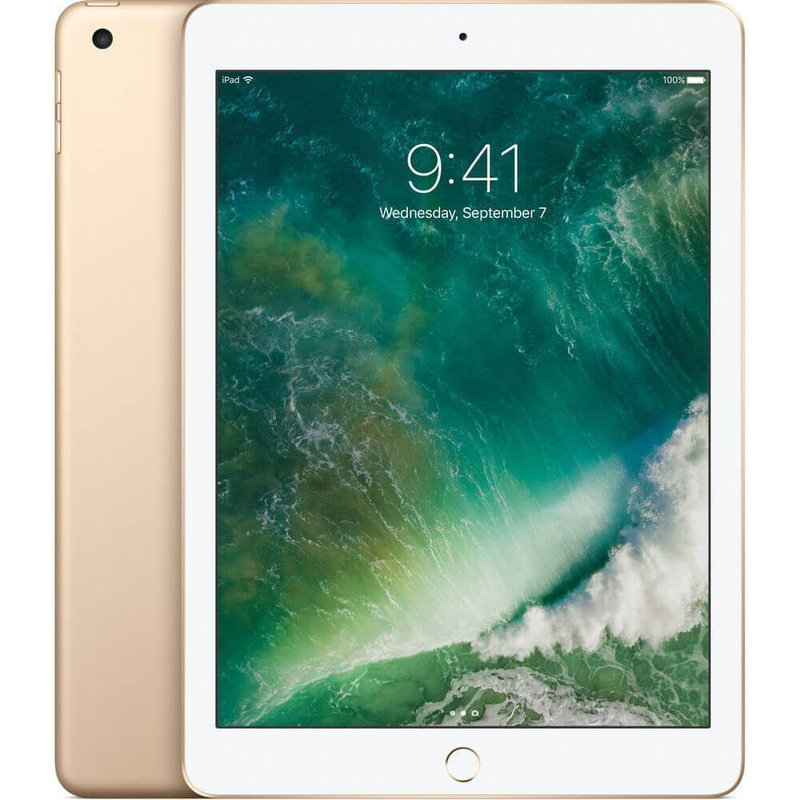 The survey will be open until September 30, 2017. 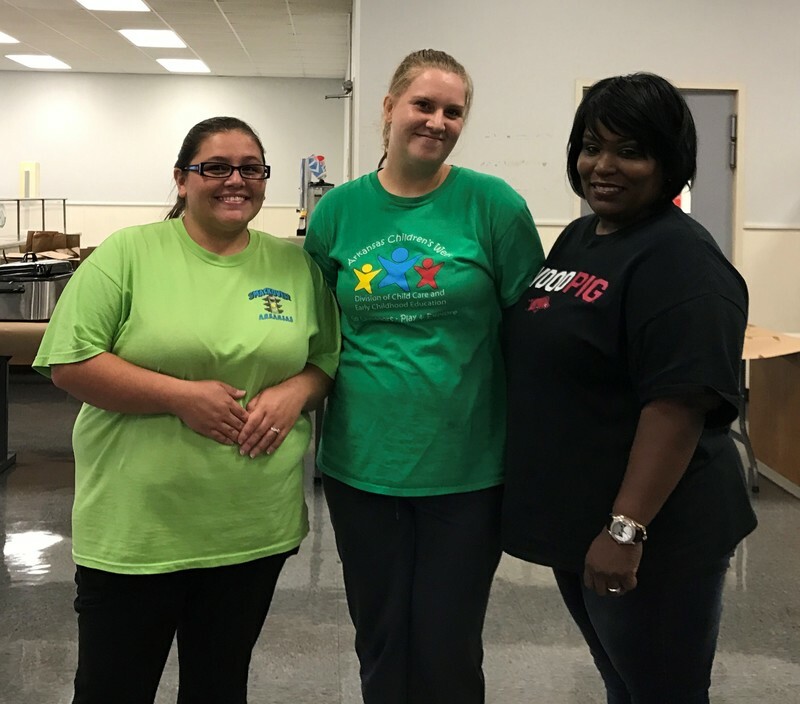 Joining our SNSD Cafeteria Staff are Jackie Hampton (Norphlet campus), Jessica Born (Smackover campus), and Tiffany Parker (Smackover campus). Welcome to the SNSD, Ladies!!! The Athletic Booster Club meeting will be Tuesday, August 1st, at 6 pm in the auditorium. All parents are welcome and encouraged to join and serve! The meeting will include electing the 2017-2019 Booster Club Officers. Please plan to attend and show your support for the Bucks! 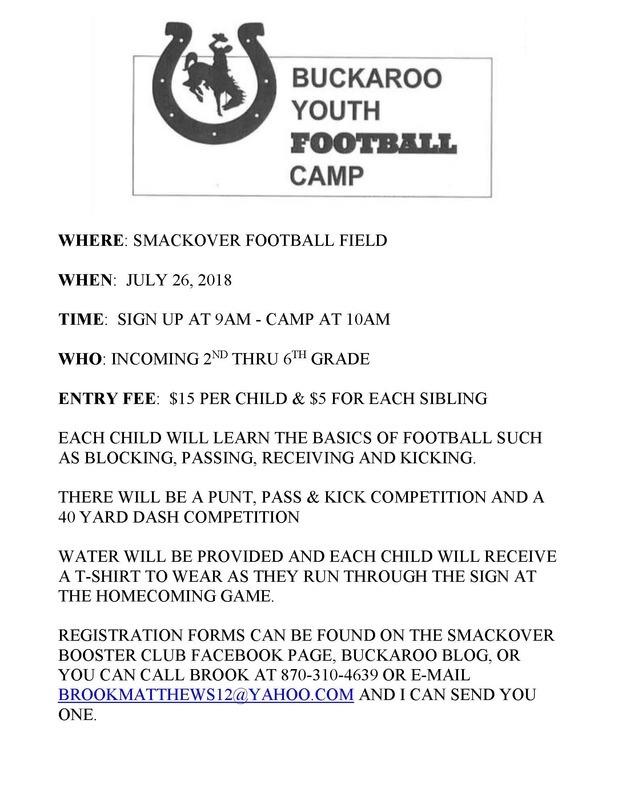 SHS FOOTBALL PROGRAM ADS Are you interested in supporting the Smackover High School Buckaroos by sponsoring an ad in the football programs? 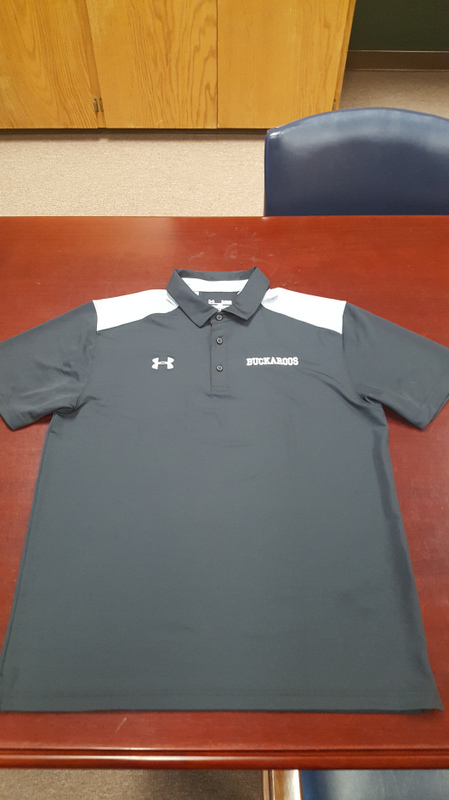 If so, click on the link below:SHS Football Program Ad form linkPlease note that the deadline to purchase an ad is August 18, 2017.